It is easy to see why Scotland is one of the world’s premier Atlantic Salmon fishing destinations. There are a multitude of famous and prolific salmon rivers across the country, which offer some of the finest salmon fishing for even the most discerning of anglers. It is the huge variety of salmon fishing available in Scotland that makes it such a salmon angler’s paradise. From the smaller more intimate rivers of the Scottish Highlands, to the larger world-famous rivers like the Dee, Spey, Tay and Tweed - Scotland truly has it all. You can salmon fish in Scotland for eleven months of the year and therefore it has one of the longest Atlantic Salmon fishing seasons in Europe. Each river has a different opening time but most of the rivers across the country generally open in January or February and close in September or October, although there are a few rivers which permit salmon fishing until the end of November. 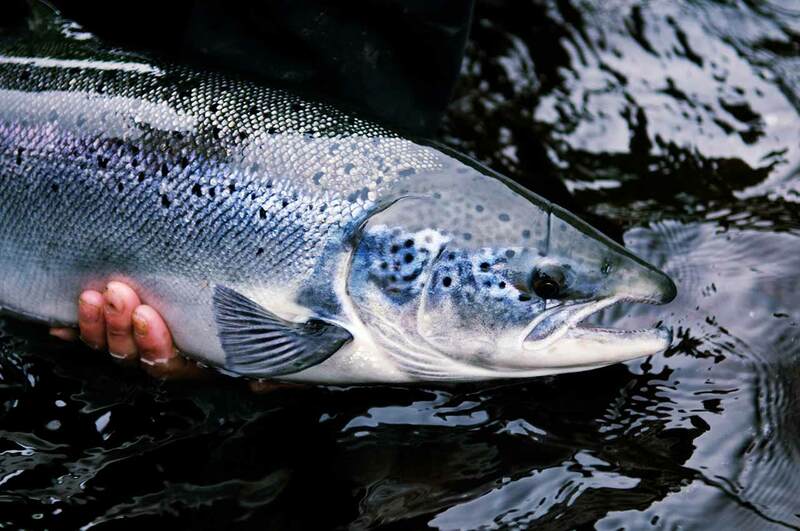 Fresh, hard fighting salmon are caught in most of Scotland’s rivers throughout the course of a year, making it one of the most sought-after salmon fishing locations in the world. If you combine the fantastic salmon fishing opportunities with the stunning scenery Scotland has to offer, it truly is a fishing marriage made in heaven! The majority of salmon fishing beats in Scotland are set on private estates and are therefore privately owned. This ensures that that there are strict limits on the number of anglers that are permitted to fish a stretch of water at any one time. This is ideal, as it allows anglers plenty of space to fish, coupled with the chance of exploring undisturbed water. In the Scottish Highlands, many of the salmon rivers are much smaller in size compared to the rest of the country. The Thurso, Naver, Helmsdale and Oykel are just a few examples of famous salmon rivers in this part of Scotland. Many of the rivers in this region are spate rivers, which means that they rely a lot on rainfall. Sport can be fast and furious after a lift in water following heavy rainfall. As these rivers are smaller, they offer the visiting angler a much more intimate experience of salmon fishing. The water in these rivers are often crystal clear, so stealth tactics can pay rich dividends. The Highland rivers enjoy a good run of hard fighting spring salmon, with fresh fish being caught from mid-January. Spring catches usually peak in April and May. The months of June and July usually mark the start of the summer run. At this time of year, good numbers of grilse and larger summer salmon are regularly caught. 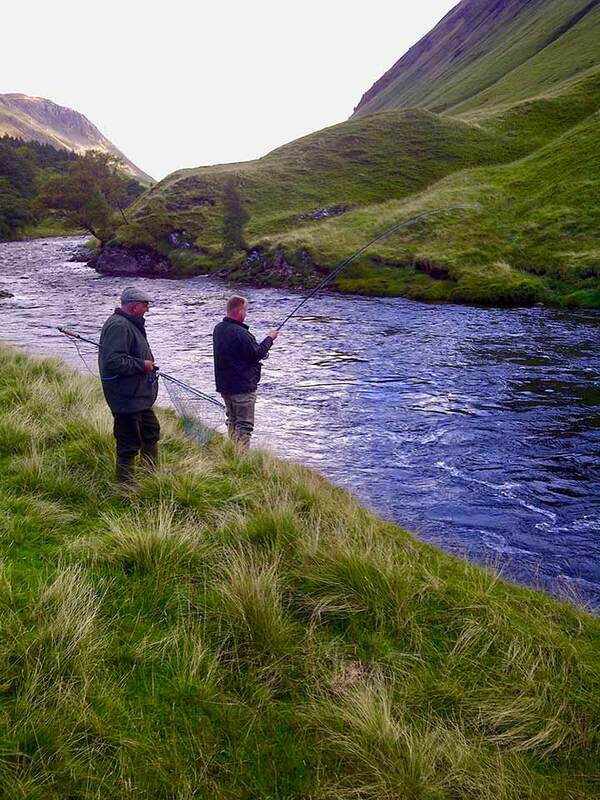 The summer run continues until the end of August and given adequate water, some of the rivers in Highland Scotland can provide some excellent summer sport for the visiting angler. The River Spey is also classified as a Highland river. The Spey is, of course, the birthplace of the world famous double handed “Spey cast”. The River Spey is one of Scotland’s “big four” salmon rivers and runs through Scotland’s stunning whisky country providing a spectacular backdrop to the salmon fishing experience. Some of the fly water on the river is second to none. Salmon fishing on the Spey starts in February and fresh fish are caught from opening day onwards. Usually, it is the beats located on the middle and lower parts of the river which prove to be the most productive during the early part of the season. However, as the water temperature rises in April and May, and salmon enter the Spey in greater numbers, more fish are caught further upstream. Traditionally, the Spey is probably best known for its summer fishing. Large numbers of grilse and summer salmon usually enter the river from late May onwards. This ensures good sport for the angler throughout the summer months. The river closes at the end of the September. Towards the end of the season, sport on the lower river can prove very fruitful, especially if there is a good run of autumn salmon. Probably the most famous, and prolific river for spring salmon fishing in Scotland is the River Dee - located in Aberdeenshire. The Dee is another one of Scotland’s “big four” salmon rivers. The River Dee has crystal clear waters, which offers its own unique challenges to the visiting salmon fisher. This stunning river produces large numbers of fresh fish, from when it opens in early February through until the end of September. Some of the beats located on the middle and lower river remain open until the 15th of October. During the early part of the season it is the beats on the middle and lower river which produce the bulk of the action, but just like the Spey. Once the water temperature begins to rise, the fish move further upstream. Indeed, the Dee is such a productive river, that even the Queen has her own stretch of water on it! In recent years, the summer fishing on the River Dee has improved significantly. There appears to be more grilse and larger summer salmon entering the system. In addition to the salmon fishing at this time of year, there are also usually bountiful runs of Sea trout. These magnificent fish can often provide a welcome distraction to the salmon fishing on the river. The salmon fishing season on the River Dee draws to a finally in mid-October, and once again it is the beats on the lower river which produce the bulk of the fresh fish later in the season. The mighty River Tay is the longest river in Scotland. It is also another one of Scotland’s “big four” salmon rivers. It flows through the centre of beautiful Perthshire, the very heart of Scotland itself. The Tay is mighty by name, and by nature, as it is big in size and very fast flowing in places. The river has a reputation for producing big fish and still holds the British rod caught record for an Atlantic Salmon - which stands at a colossal sixty-four pounds. The River Tay is one the first rivers in Scotland to open, on the 15th of January, and it produces fish regularly, from opening day onwards. The spring catches on the Tay are improving year upon year. Good numbers of spring salmon enter the river from February onwards and the spring run usually peaks in late April and May. Many of the fish caught at this time of year are destined for some of the rivers tributaries - the Isla, Tummel and Lyon, which are excellent salmon rivers in their own rights. July is usually when the summer fish tend to arrive in greater numbers, bringing with them generous amounts of grilse. Traditionally, the Tay has a famous autumn run. Large, fresh, hard fighting salmon start entering the river from early September which ensures that there is plenty of good sport to be had. The season ends in mid-October, and there are usually fresh fish caught up until then. Probably, the most prolific river in terms of catches in Scotland is the River Tweed. The Tweed winds its way through the rolling hills of the Scottish Borders, with some of its banks set in both Scotland and England. The river opens at the beginning of February, and has a decent spring run. Early in the season, the majority of the fish are usually caught from beats located on the lower part of the river. From March and April onwards, the middle beats also enjoy some good sport. During the summer months, it is usually the bottom beats of the river that are the most productive, especially if the water is low. The river also has an excellent run of Sea trout, with fish weighing into double figures regularly caught. 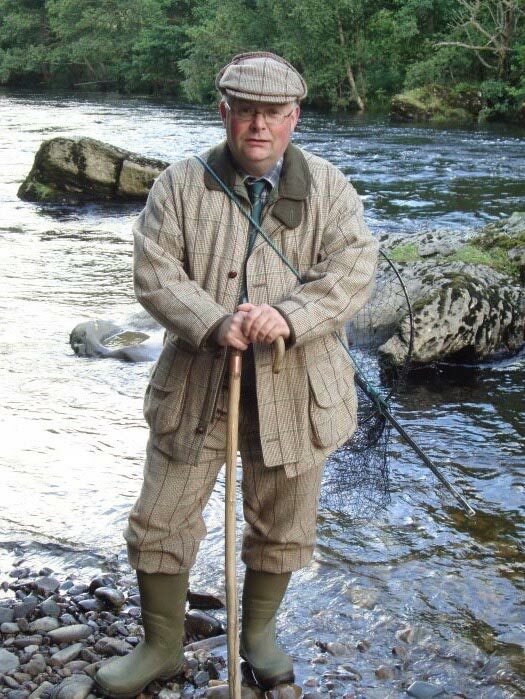 The Tweed is probably most famous for its autumn run of salmon. As the river is open until the end of November, fresh autumn fish are caught from early September until the end of the season. People from all over the world come to fish the river at this time of year and it is easy to see why. Catches in double figures for a day is not uncommon on some of the beats in October. Given adequate water, it is usually the beats on the middle and lower river that excel at this time of year. Towards the end of the season beats on the upper river can also produce decent numbers of fish. Away from the mainland there are also some fantastic salmon fishing opportunities on some of the Scottish Islands. The Hebrides are a group of Islands located on the West coast of Scotland. These Islands offer the visiting angler some excellent sport on both lochs and rivers. Many of the lochs are interconnected by smaller rivers and like the Scottish Highlands, many of the rivers fish better after there has been a lift in water. Loch style salmon fishing from a drifting boat can often produce good results. The best of the sport on these rivers and lochs are usually during the summer months, when impressive numbers of grilse can be caught. Most of the fisheries in this part of Scotland are open until the middle of October. As you can see, the salmon fishing opportunities in Scotland are truly endless. The rivers that are mentioned above are just a few of examples of the wonderful salmon rivers available for the visiting fly-fisher to explore, but there are many more. When you combine all the copious salmon fishing opportunities, with the beautiful scenery and excellent accommodation options, it is easy to why people return to Scotland, year after year, to chase hard fighting Scottish silver. The Scottish spring salmon is one of the most sought-after fish among the fly fishing fraternity. These magnificent fish are often elusive creatures which are big in size, extremely powerful and can give you a fight that is truly unforgettable. These fish can weigh anything from ten to thirty pounds, and playing these strong fish is definitely not for the faint hearted. In Scotland, we classify spring salmon fishing as being from the beginning of the season (which depends on the river itself and can usually be any time in January and February) through until the end of May. A number of Scottish rivers open in mid-January and produce spring salmon from opening day onwards. 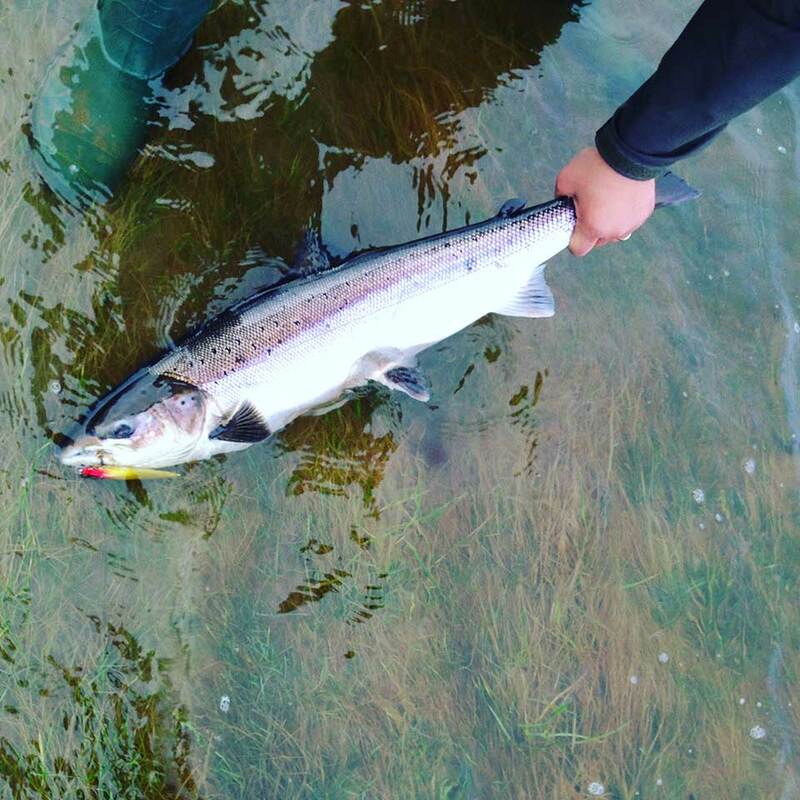 The runs of fresh fish usually peak in April and May and this is why these months are often the prime time to catch a Scottish springer. There are so many prolific salmon rivers in Scotland, so the question is where are the best places to catch one of these magnificent fish? As always, every season is different, and a lot depends on the weather and water conditions. However, there are definitely some rivers which produce more springers than others year after year. 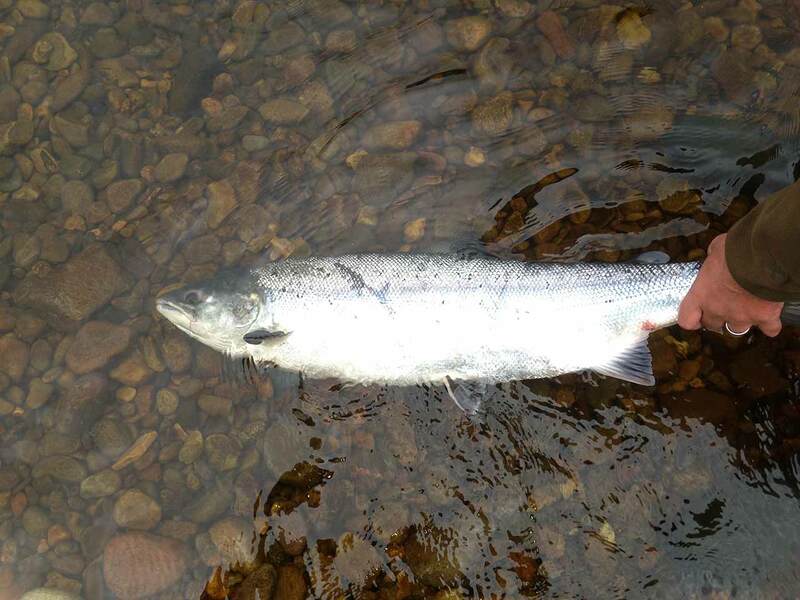 In the Scottish Highlands, a number of salmon rivers open in mid-January. These include, the Thurso, Helmsdale, Naver and Moriston amongst others. Many of these rivers regularly produce fresh fish in January. These rivers have the added advantage of being generally smaller in size, compared to their central and southern counterparts. This means that they are more easily coverable with a fly rod. As a fresh springer is normally quite aggressive, if it sees a fly, it will usually go on to take it. So, on a smaller river there is more chance of the fish seeing the fly. This can be a big advantage when trying to locate one of these often-elusive fish. This may also explain why some of the Highland rivers can be quite productive during the early part of the season. On most of these rivers the prime spring months are April and May. This is usually when the numbers of spring salmon entering the river peak and the most abundant catches are made. The River Spey is also classified as a Highland river and it is the fastest flowing river in the UK. The Spey truly showcases some of the best spring salmon fishing that Scotland has to offer. The river opens in early February, and fresh fish are caught from the beginning of the season onwards. 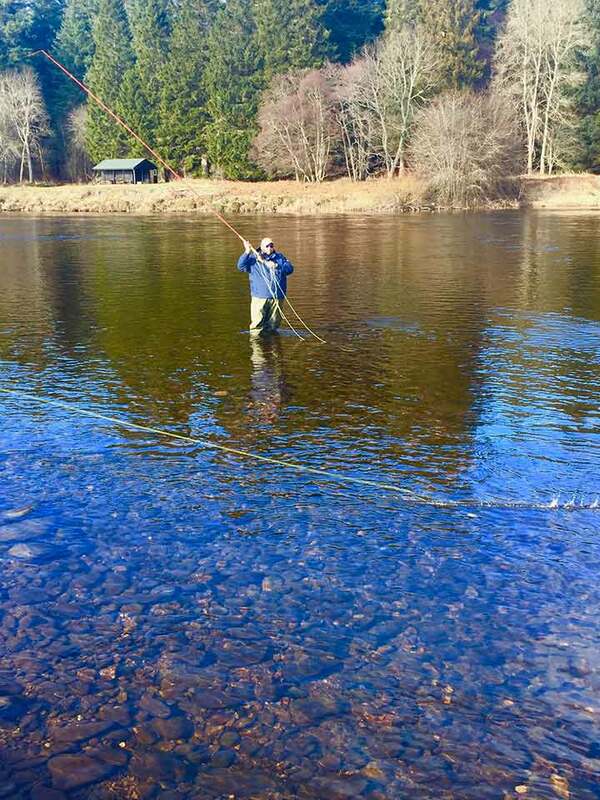 The spring fishing on the Spey depends a lot on water temperature. The river itself originates in the foothills of the Monadhliath Mountains and these mountains are often covered in snow during the early part of the season. Once the snow starts to melt, the water temperature can often drop significantly which can affect the fishing. If the water temperature is low many of the fish lie in the lower reaches of the river. As we head into April and May and there is a lift in water temperature, the fish run further up the river system, ensuring excellent sport on most of the beats up and down the river. 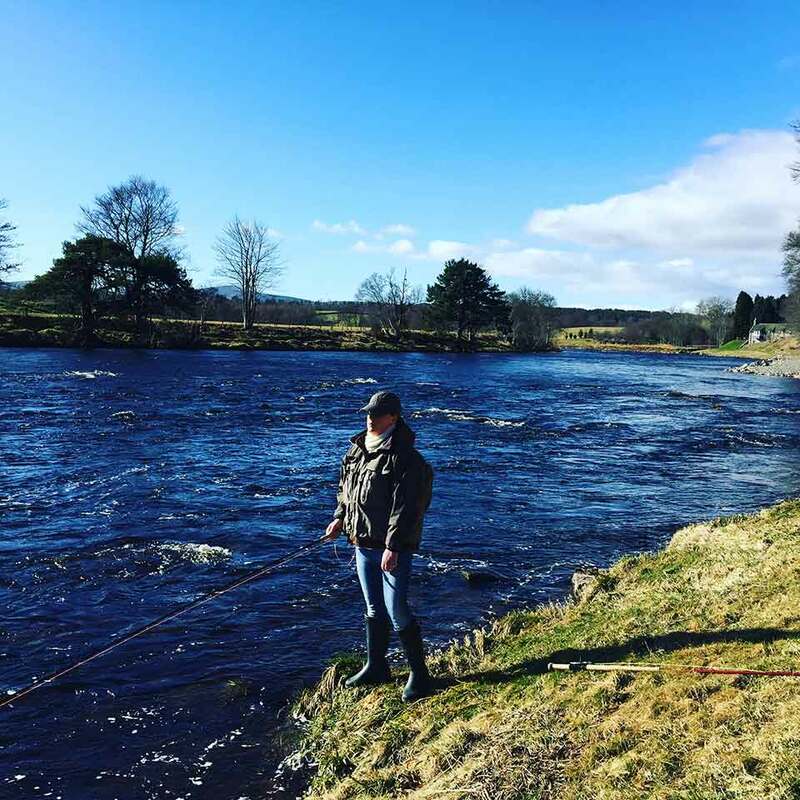 Over the past few years the spring catches have improved greatly on the River Spey and in 2017, fishers enjoyed a bumper early season spring run. Probably the most famous river in Scotland for producing decent numbers of spring salmon is the River Dee. The Dee opens its banks to anglers in early February and usually produces good numbers of spring salmon from opening day onwards. The river, although similar in size to the Spey, differs by having much clearer water. 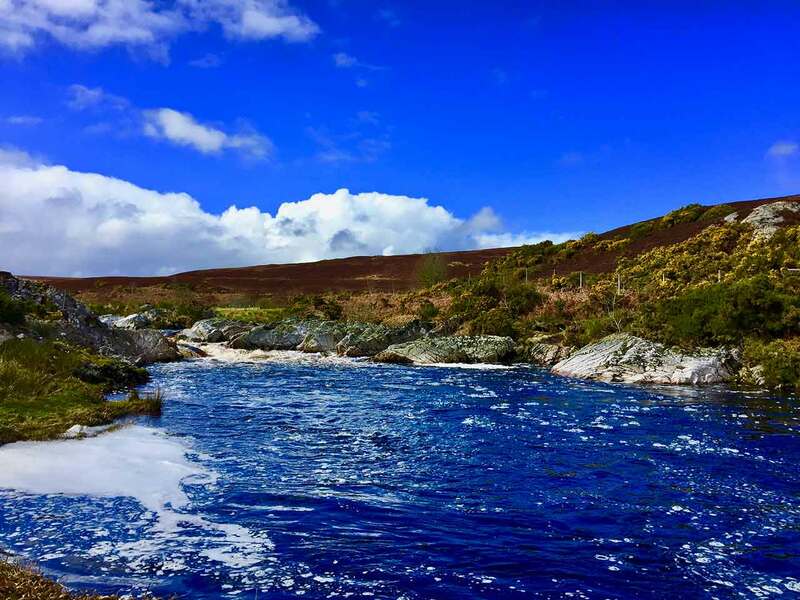 The Dee runs through the heart of Aberdeenshire and some of the fly water on the river is truly mesmeric. Usually, early in the season, it is the beats on the middle and lower river which enjoy the bulk of the sport. As the water temperature rises, the fish tend to run further upstream and the beats on the upper river start producing fish on a more consistent basis. In recent years the spring run on the River Dee has not been as fruitful as it once was, but in 2017 there was a marked improvement in catches. The River Dee continues to be one of the most prolific spring salmon rivers in Scotland. The River Tay, one of Scotland’s “big four” salmon rivers, has a reputation for producing good numbers of spring salmon. 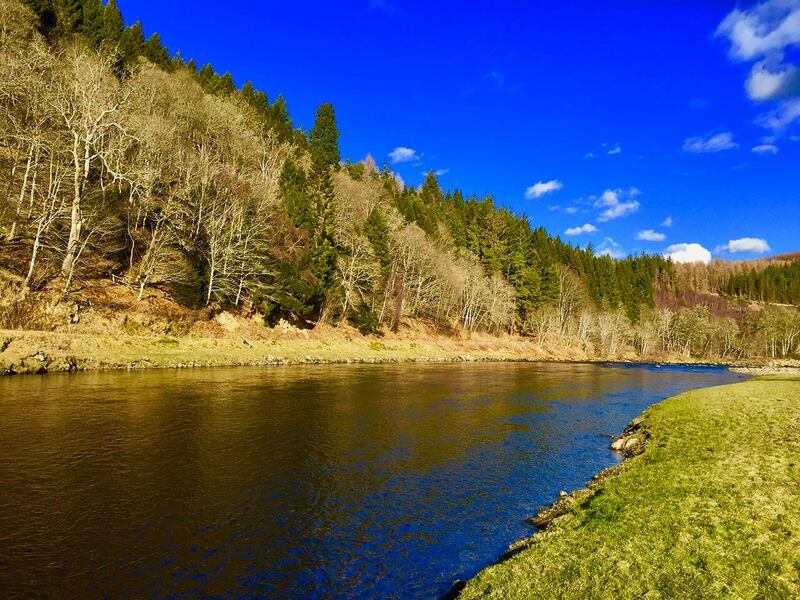 The Tay is the longest river in Scotland and runs through the heart of stunning Perthshire. It is much bigger in size compared to the Spey and the Dee. Over the past few years, the spring fishing on the river has improved on an annual basis. The river opens on the 15th of January and fresh fish are caught from opening day onwards. Many of the fish that are caught in January and February are destined for Loch Tay and beyond, at the head of the system. 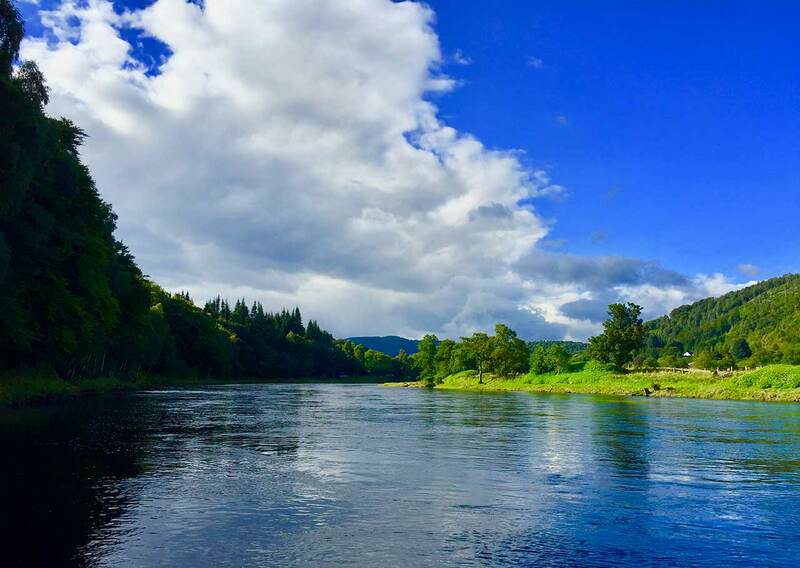 As we move later into the spring period on the Tay, many of the fish which enter the river, often run upstream to some of the river’s tributaries like the Lyon, Tummel and Isla. These fish tend to enter the system from March onwards. Usually, the runs of fresh spring fish peak in April and May. When the water temperature is low during the early spring, it is the beats on the lower river which enjoy the best of the sport. There are a number of temperature barriers in this area of the river, which can often slow down any running fish. Once the water temperature begins to rise, it is the beats on the middle river which will start to produce fish on a more consistent basis. 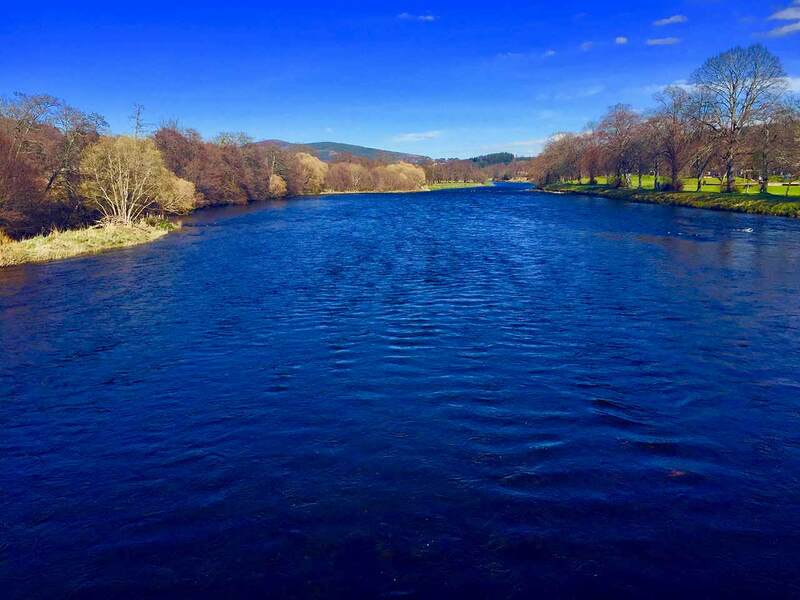 In terms of the tributaries of the Tay, the River Tummel is probably the most prolific river during the spring period. 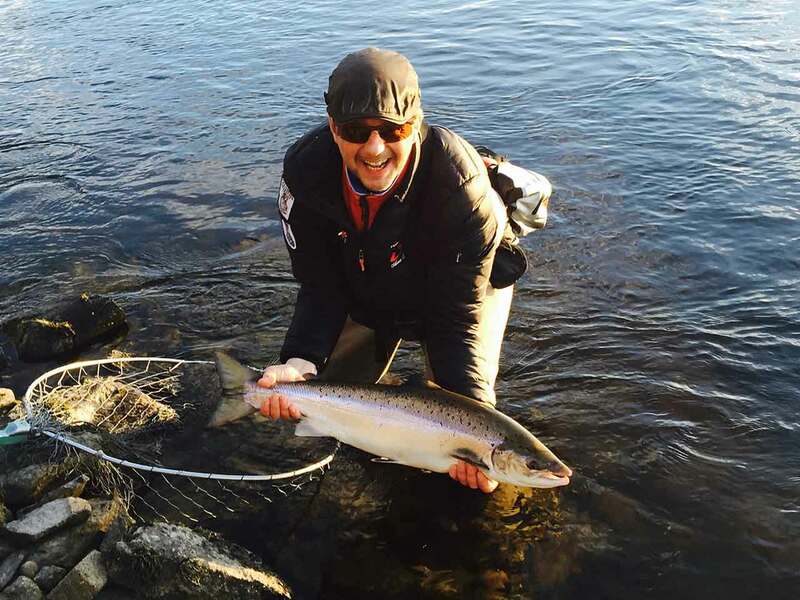 Decent numbers of fish enter the Tummel from mid-March onwards. The Tummel is a relatively short river and at the head of it, located in Pitlochry, is a dam, which acts as a temperature barrier. Large numbers of spring salmon regularly congregate below the dam, and once the water temperature rises (usually in late April) they start running through the man-made fish pass and enter Loch Faskally. The River Teith, is one of Scotland’s best kept secrets. It is much smaller than the River Tay but can be just as productive during the early spring months. The River Teith originates in Callander, and runs through beautiful Stirlingshire, in central Scotland. The river opens in early February and it also has a good spring run. Fresh fish are usually caught from opening day onwards and numbers peak in late April May. The river does fish better after there has been a lift in water. As the river is much smaller in size, in comparison to some of the other rivers in Scotland, it has the added advantage of being easily coverable with a fly rod. There are so many wonderful locations around Scotland that offer excellent spring salmon fishing opportunities and the list is endless. 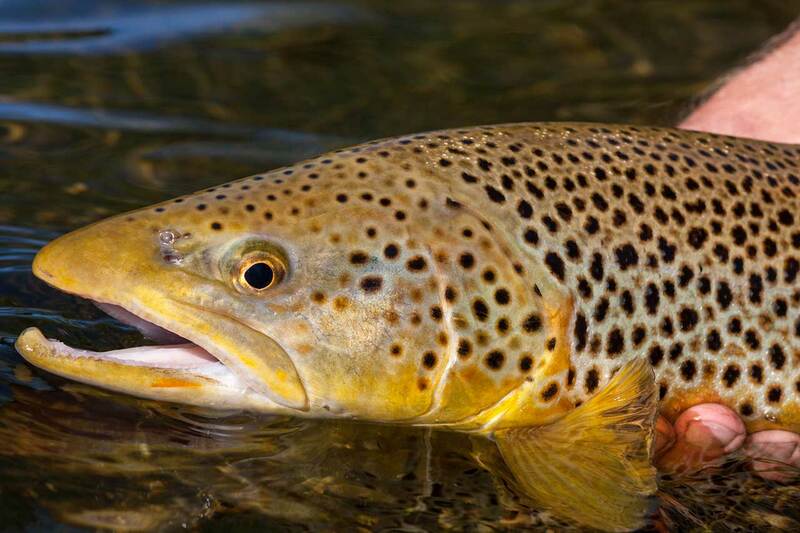 The rivers mentioned above have, year upon year, consistently produced early season fish. This is what makes them the top destinations in Scotland for spring salmon fishing. The world-famous River Spey is one of the most productive salmon rivers in Scotland. It is also the birthplace of the double handed "Spey cast", which is commonly used when fly fishing for Atlantic Salmon. The Spey is one of the fastest flowing rivers in the UK and runs through the heart of North East Scotland. 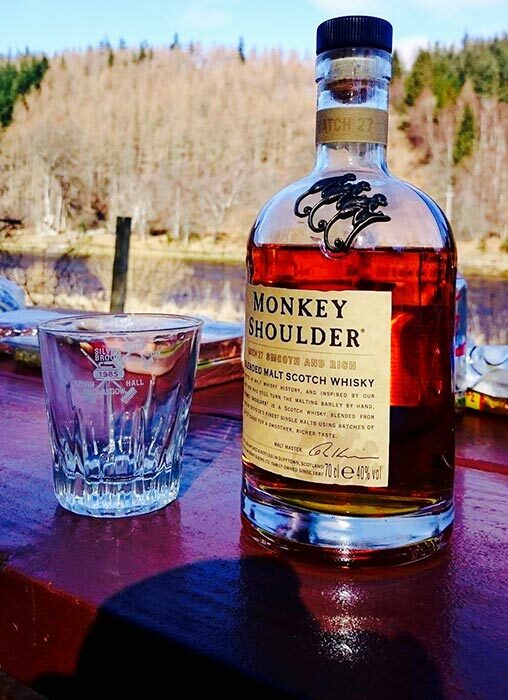 Speyside is not only famous for its breath-taking scenery and fabulous salmon fishing but also for its whisky distilleries. There is a plethora of whisky distilleries in this region that produce Scotland’s famous tipple. Often, whilst you are playing a salmon on the river, you can taste the sweet smell of barley emanating from any one of them. The headwaters of the River Spey originate high up in the Monadhliath Mountains. The river then winds its way through the beautiful Highland countryside, close to the towns of Grantown, Aberlour and Rothes. The river finally enters the sea at Spey Bay which is located by Fochabers. The River Spey shares many of the characteristics of a typical Scottish Highland river but is much larger in size, which can offer its own unique challenges. The water is often slightly tinged in colour, especially after a spate and this is because of peaty moorland at the headwaters of the river. The Spey boasts some fantastic fly water and it truly showcases some of the finest salmon fishing Scotland has to offer. The vast majority of the beats on the river are private but there are a few stretches which are controlled by local angling associations. These stretches of water can give the visiting angler the opportunity to fish on one of Scotland’s most prolific salmon rivers at a reasonable cost. 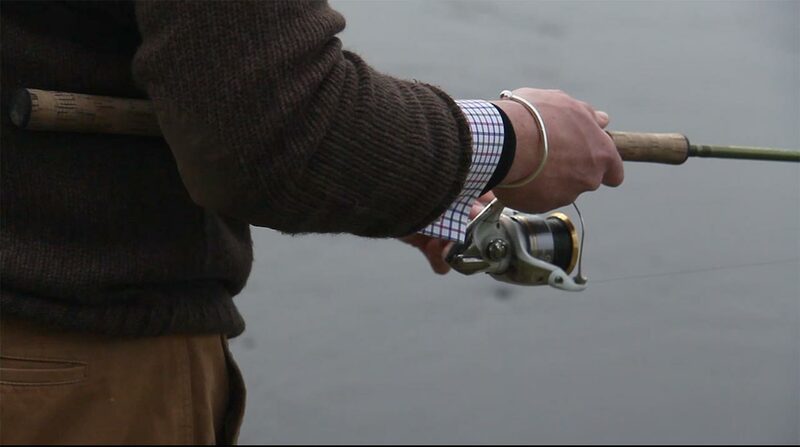 The season on the River Spey commences at the beginning of February and runs through to the end of September. Salmon are regularly caught from opening day onwards. The spring season runs from February through to the end of May. 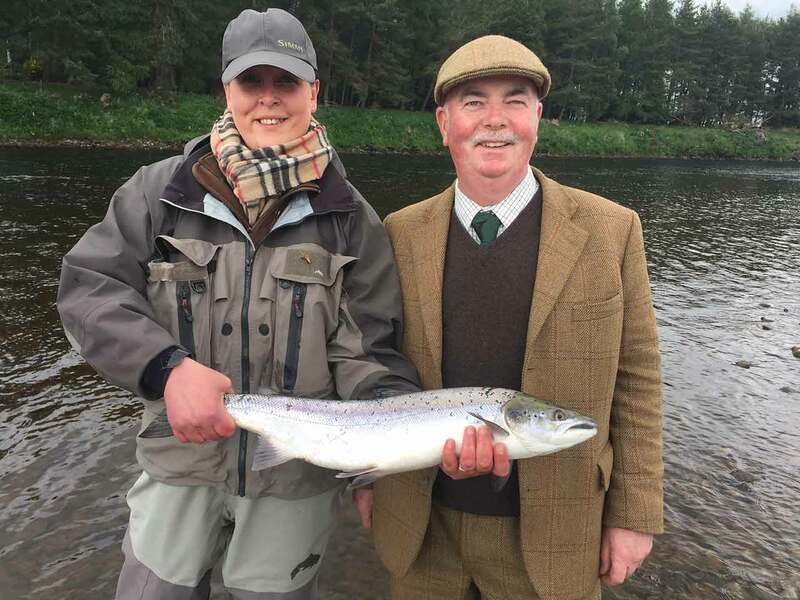 In recent years, the spring run on the river has improved significantly, making it now one of the top destinations in Scotland to catch a spring salmon. During the early part of the season, it is usually the beats on the middle river (from Aberlour downstream) which enjoy the best of the sport. As we move into April and May, the water temperature usually starts to rise which encourages fresh fish to run further upstream in greater numbers. This ensures that beats located on the upper river begin to produce more consistent catches. 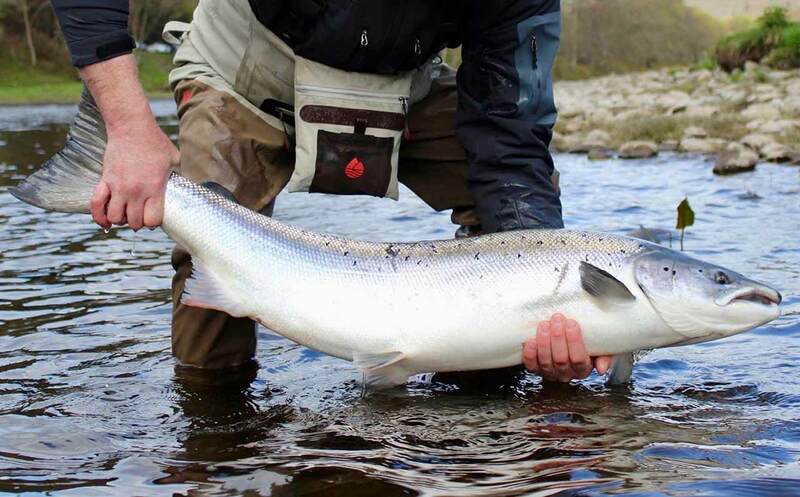 The numbers of spring fish entering the river usually peak in April and May, making it a prime time of year to catch that hard-fighting Scottish spring salmon. Summer salmon and grilse usually begin entering the system from mid-June, with runs usually peaking in July. The Spey is famed for producing large numbers of grilse and Summer salmon which can provide some excellent sport for the visiting fly-fisher. It is usually the beats located on the middle and lower river which produce the bulk of the action at this time of year. Towards the end of the season, especially if the water is low, most of fresh fish are caught on the lower river. 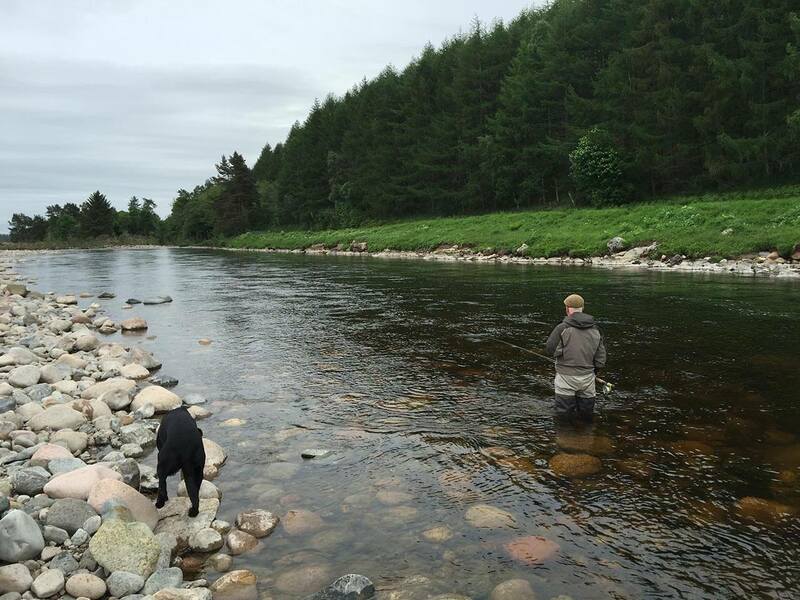 Many of the fish that enter the Spey in late August and September do not run too far upstream, making the lower beats around Fochabers particularly productive. 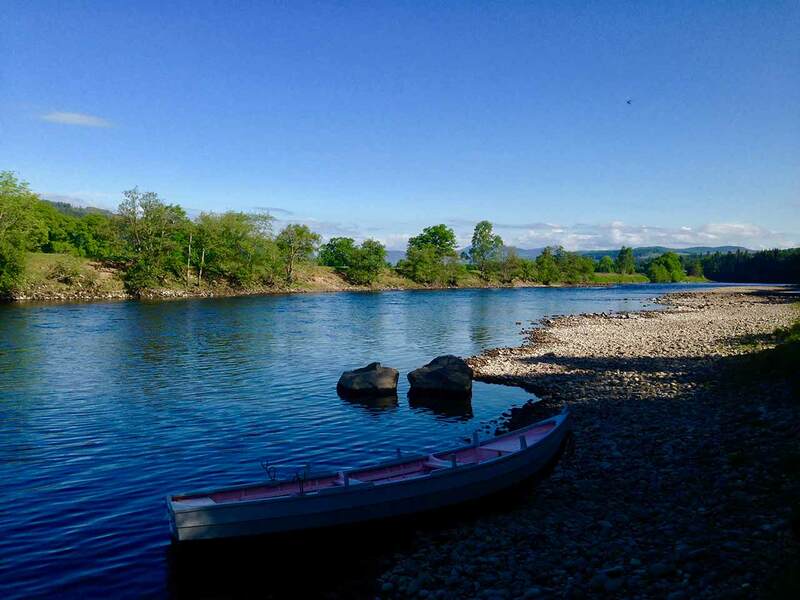 The River Spey is a truly special salmon river, and this is why anglers from all over the world return year after year. 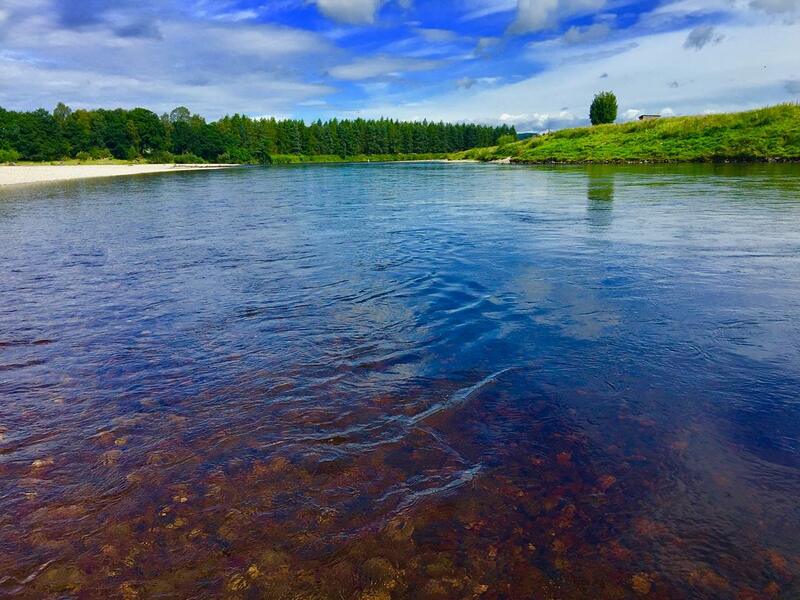 With some of the best fly water in the country, coupled with prolific spring and summer runs of salmon, it is easy to see why the salmon fishing on the Spey is truly world class. The River Dee is another of Scotland’s “big four” salmon rivers and has an excellent reputation for producing hard fighting Scottish salmon. The river is probably most famous for its large runs of spring salmon, although encouragingly, there have also been good numbers of fish caught during the summer months, in recent years. 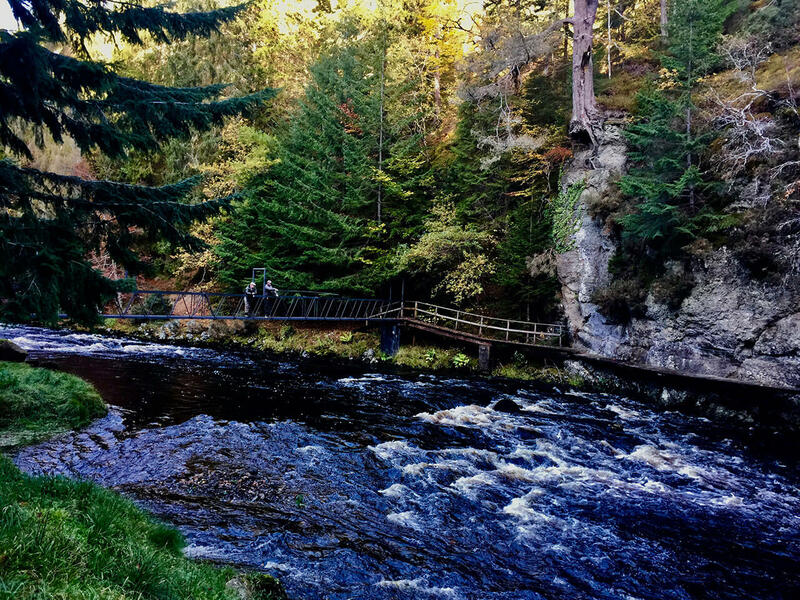 The Dee rises high up in the Cairngorm Mountain range and flows through magnificent Royal Deeside, close to the towns of Braemar, Aboyne and Banchory, towards the City of Aberdeen, where it finally meets the sea. In total the river is around eighty miles in length. 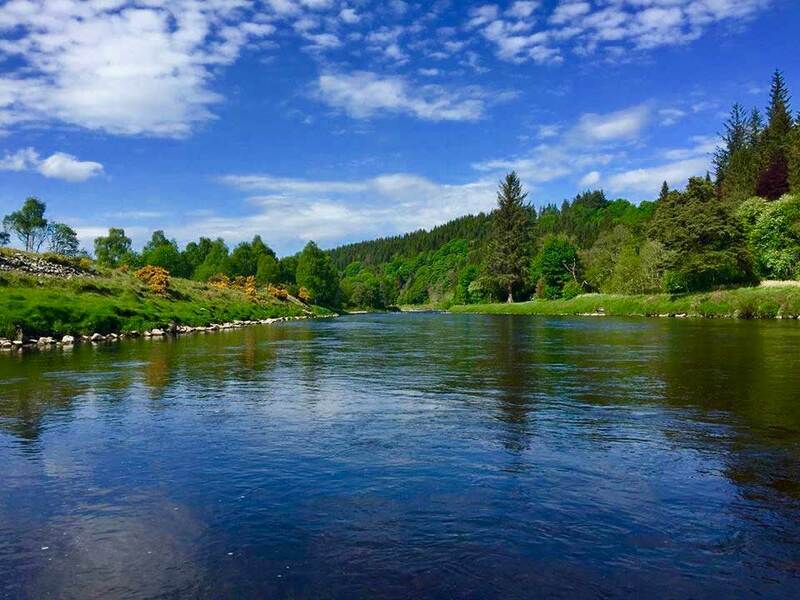 The Dee is a very rocky, fast flowing river with crystal clear water and is similar in size to the River Spey which makes it perfect for fly fishing. Many of the pools on the river are a treat to fish with the fly rod with the fly line swinging around in the current, at just the perfect speed. Most of the beats on the River Dee are privately owned but there is some Association Water. The majority of beats on the River Dee open at the beginning of February and the season extends until mid-October. The beats on the upper river (upstream of Aboyne Bridge) usually open on the 1st of March and close at the end of September. Fresh fish run the river in decent numbers throughout the season, making it a top salmon fishing destination in Scotland. During the early spring months, much depends on the water temperature as to where the best beats are located. If the water temperature is low, then it is the beats on the lower and middle river that are usually the most productive. However, as the water temperature slowly starts to rise the main bulk of the spring run nose further upstream. By late April and May, beats on the upper river begin to produce fresh fish on more consistent basis. Many of the beats on the upper river continue to produce spring fish well into June. 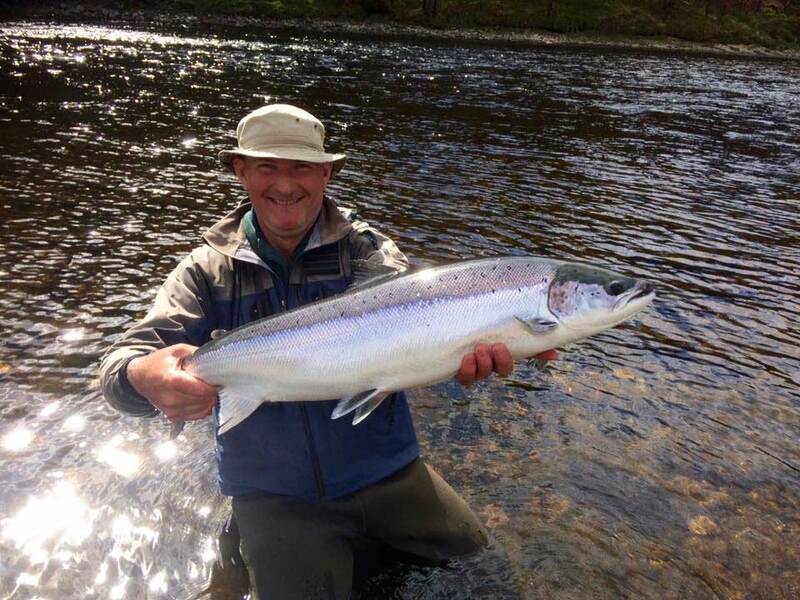 The summer fishing has greatly improved in recent years on the Dee with grilse and summer salmon being caught from mid-June onwards. Many of the summer fish that enter the river, head for the River Feugh, which is a tributary of the Dee. The Feugh enters the river just below Banchory and it is usually the beats downstream of the Feugh that produce the best of the summer sport. In addition to the good runs of summer fish at this time of year, the Dee also enjoys a decent run of Sea trout. Fish over five pounds are not uncommon and can provide some great fun on a single-handed rod, coupled with light tackle. In September and October, the bulk of the autumn fish are caught on the lower beats. Indeed, at this time of year good numbers of fresh fish can be caught from the lower river. With the River Dee traditionally producing decent numbers of spring salmon as well as summer fish in recent years it has now become one of Scotland’s most productive salmon rivers. It is a very popular choice for visiting anglers and it is easy to see why. With the Royal Family having its own beat on the river it signifies how highly rated it is among Scottish salmon fishing circles. The world-famous River Tay needs little introduction in salmon fishing circles. 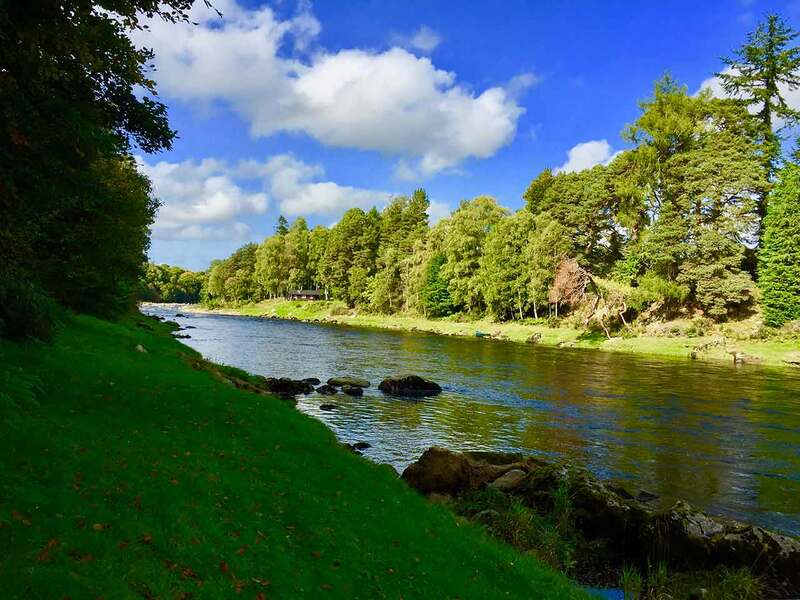 The River Tay runs through the heart of beautiful Perthshire and is arguably the most famous salmon river in the British Isles. It is the largest river in Britain and is mighty, not only in size, but also in reputation. Annually the Tay produces over six thousand salmon and grilse. The Tay still holds the British rod caught record for the heaviest salmon, weighing in at a colossal 64lbs. To this day, the River Tay still has a reputation for producing big fish. Each year a number of fish over the thirty-pounds mark are caught and fish of over forty pounds are not uncommon. The Tay has a massive catchment area, with a number of large tributaries like the Isla, Tummel and Lyon amongst others, flowing into the main river. Some of the headwaters of the river rise from Ben Lui, which is located close to the west coast of Scotland, while others originate from the Grampian Mountains in the north. The main stem of the river flows out from Loch Tay at Kenmore, and then through stunning Strathtay. It is at this point that rivers like the Lyon and Tummel join the mainstem. 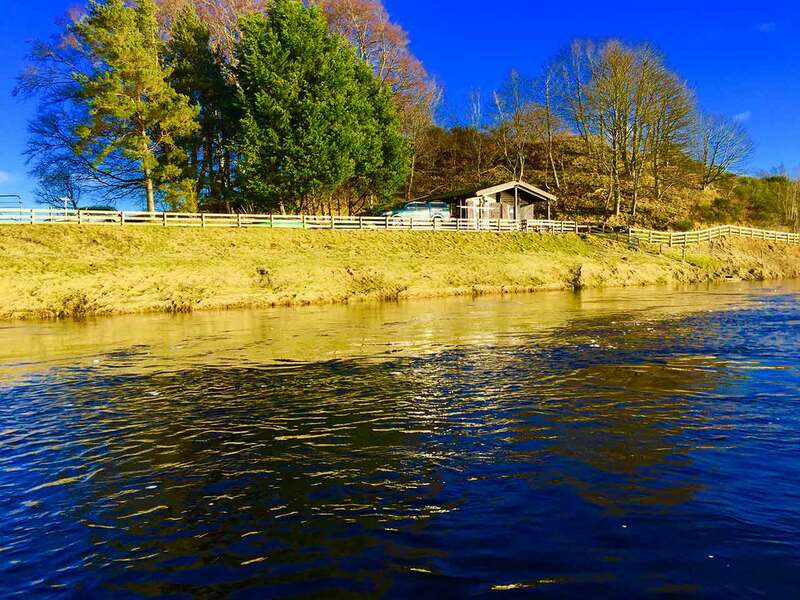 From the confluence of the Tummel downstream, the river becomes much wider and is known as the middle Tay. The river flows by pretty Perthshire towns like Dunkeld and Murthly before another major tributary, the Isla joins the main river. At this point the river almost doubles in size as it flows towards Perth. The river finally enters the estuary at Newburgh and flows onwards towards the City of Dundee. 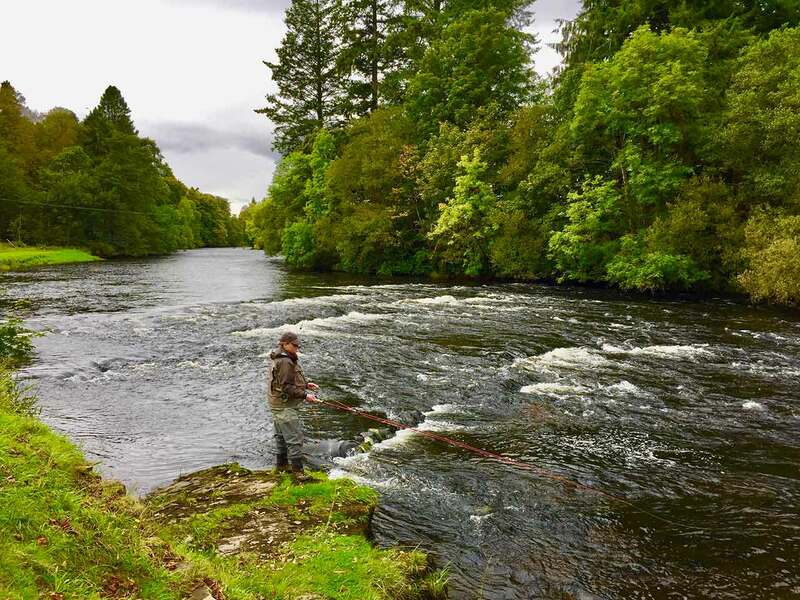 The River Tay offers great salmon fishing in Scotland throughout the season and even when the river is at its lowest levels, salmon will still run upstream due to there being adequate water from a number of lochs at the headwaters of the system. The river produces fresh hard fighting salmon from opening day in January right through to October. The Tay also has its own unique method of salmon fishing which is regularly practiced and is known as harling. Harling is performed using a motorised boat. 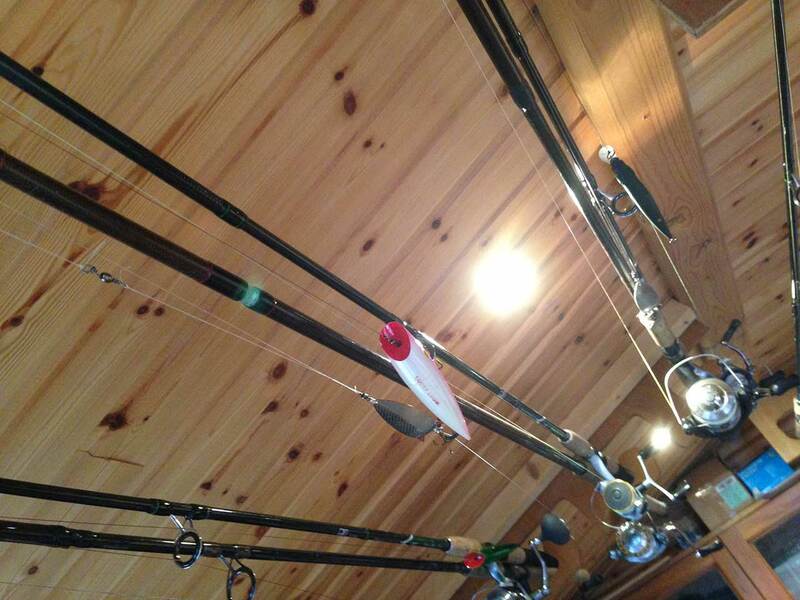 Usually three spinning rods which are placed in rod holders have lines with lures on them moving behind the boat. The ghillie then expertly manoeuvres the boat from side to side, covering the likely lies, while gradually dropping down the pool. The motion of the boat, coupled with the strong current, gives the lures a life-like motion which can often prove too irresistible for a salmon. As the Tay is such a big river this can be a particularly effective method when used to cover large pools in the spring and autumn months. The River Tay opens its banks to anglers on the 15th of January and this is a much anticipated date on the Scottish salmon fishing calendar. The season extends until the middle of October. Fresh fish are caught regularly from opening day onwards. Usually in January and February the majority of fish are caught spinning. During the early spring months, many of the fish entering the system are destined for Loch Tay and beyond, but the speed at which they run upstream is dictated by water temperature. If the water is very low, then it is usually the beats on the lower river that enjoy the best of the sport. There are a number of temperature barriers in this region of the river including the famous Linn Pool and Catholes Weir. These obstacles can often slow down the speed at which the fish run upstream. By April and May, water temperatures begin to rise, and more fish enter the river. In the late spring, many of the fish running the river are progressing towards some of the rivers larger tributaries like the Lyon, Tummel and Isla. This is when the beats located on the middle river excel. 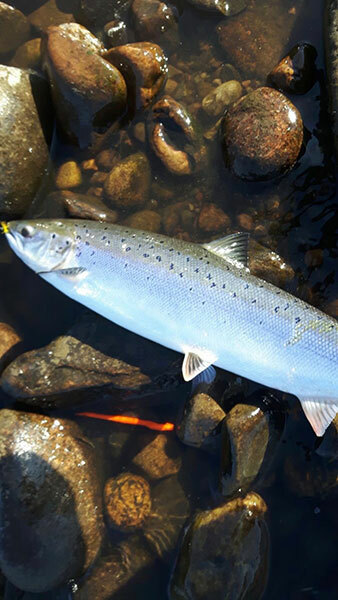 The numbers of spring salmon entering the river usually peak in late spring, and often good numbers of springers are still being caught in June. 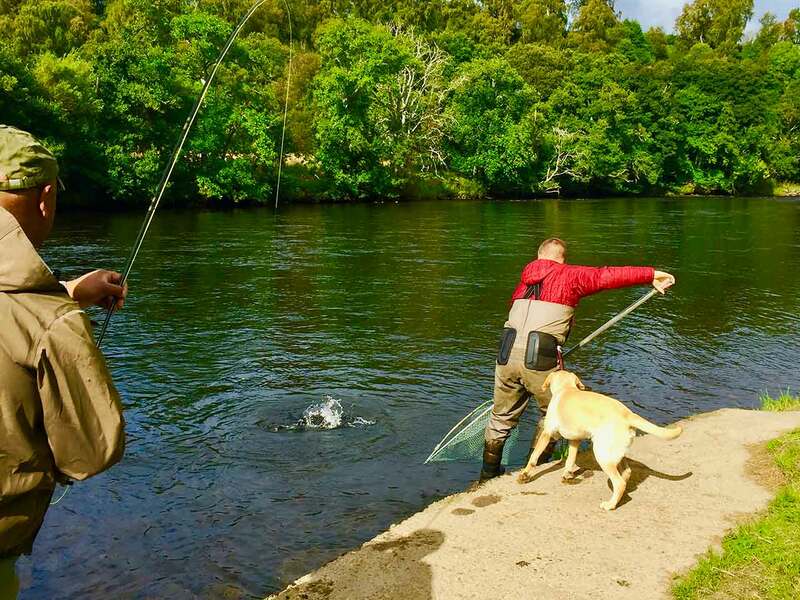 In recent years, anglers on the River Tay have enjoyed much improved catches during the spring period, making it now one of the most consistently performing early season rivers in Scotland. During the summer months good numbers of grilse and larger summer salmon enter the river. The runs of summer fish usually peak in late July and August. Some of the fly fishing opportunities on the river at this time of year are second to none. The beats located on the middle and lower river are usually the most productive at this time. Traditionally, the River Tay is probably most famous for its autumn run. Usually, during September and October, large numbers of fresh fish enter the river system. These fish are often big in size and extremely powerful. This is when large catches can be made. People from all over the world come to fish the River Tay at this time of year. Later in the season is usually when the lower beats are at their most productive. The River Tay is like no other salmon river in Scotland in terms of sheer size and power. 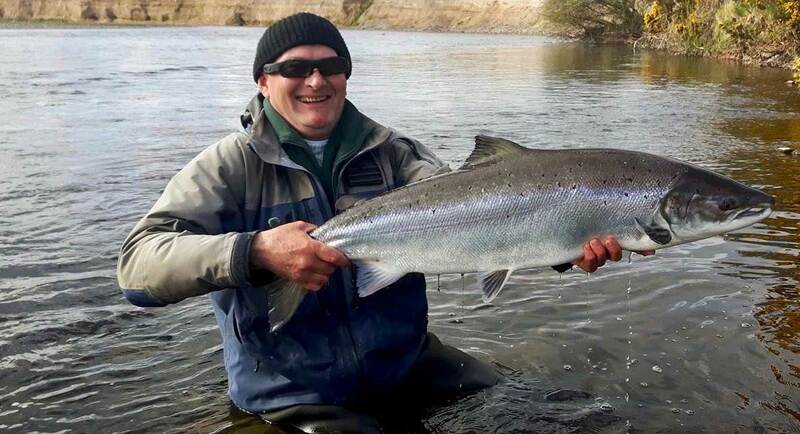 If you want to catch a big salmon in Scotland than the Tay is your answer. Most of the prime salmon fishing beats in Scotland are privately owned and are usually located within magnificent private estates. The vast majority of these beats have the services of a ghillie. The resident ghillie on a salmon fishing beat is available for everyone that is fishing on that beat. The ghillie is usually at hand through the course of the day to give advice on the best tactics and techniques to use. The ghillie may also spend some time with you whilst you are fishing a pool, pointing out the likely places where a salmon may be lying. A ghillie however, will not usually accompany you all day, as there will be other anglers on the beat that may require his help and guidance. He may also have other duties on the beat, like bank and boat maintenance. However, if you are looking for that one to one service, then it can be worthwhile hiring the services of an experienced salmon fishing guide. A fishing guide is quite different from a ghillie, as he will spend the whole day with you whilst you are fishing. Your guide will be at your side, giving advice on the best tactics to use, as well as offering you any tips required on different techniques, like fly casting, or pointing out the likely areas on the beat that could prove to be the most productive. A fishing guide will also be able to advise you on playing a salmon, once you have hooked it, and be there to net the fish if required. Enlisting the service of a fishing guide is imperative if you have done very little salmon fishing in the past, as his experience will quickly help you get the most out of your day’s salmon fishing. Often all that is required are just a few pointers in the right direction when it comes to technique and tactics, which can sometimes make all the difference between success and failure. If you have never salmon fished in Scotland before, it can be useful to enlist the services of a fishing guide. When salmon fishing in a new country, it can often be challenging to get up to speed with unfamiliar tactics and techniques that can prove successful. The fishing guide will help you with this, and with his advice and local knowledge, you should have a much more productive day. When it comes to guided salmon fishing in Scotland, every guide is different in terms of what services they offer. Most, however, will pick you up at the hotel or fishing lodge that you are residing at, and take you to the salmon fishing beat. They will then accompany you, throughout your day’s fishing, before returning you to your lodgings at the end of the day. Many anglers that are relatively new to salmon fishing will hire the services of a personal guide for the first couple of days. During this time, the angler will get to know the river and also learn about the most productive techniques and tactics. After this, they often feel that they have gained enough knowledge and skills to continue fishing by themselves, with only the assistance of the beat ghillie. This is a great option for anglers that have some salmon fishing experience. There are a number of different companies in Scotland that offer guided salmon fishing trips. They often offer their services close to the vicinity of where their company is located. Before choosing your fishing guide, it is important to look at what experience they might have in the location that you will be fishing. By doing this, you will have the utmost confidence in your guide and hopefully enjoy a successful day's salmon fishing in Scotland. Scotland truly is one of the world’s best salmon fishing destinations. It offers visiting anglers a wide range of plentiful salmon rivers to choose from, each with a very different character. This coupled with the wild, unspoiled scenery, beautiful tranquil locations and fantastic salmon fishing options makes it the ultimate angling experience, for any passionate angler. In Scotland the salmon fishing season is much longer compared to many other countries around the world. Indeed, you can actually salmon fish in Scotland for eleven months of the year, and have a realistic chance of catching a hard-fighting fresh salmon. The length of the season means that visiting anglers can fish for salmon almost all year round. It is not only the length of the season that makes Scotland one of the world’s best salmon fishing destinations. There are also so many productive salmon rivers across the country to choose from. 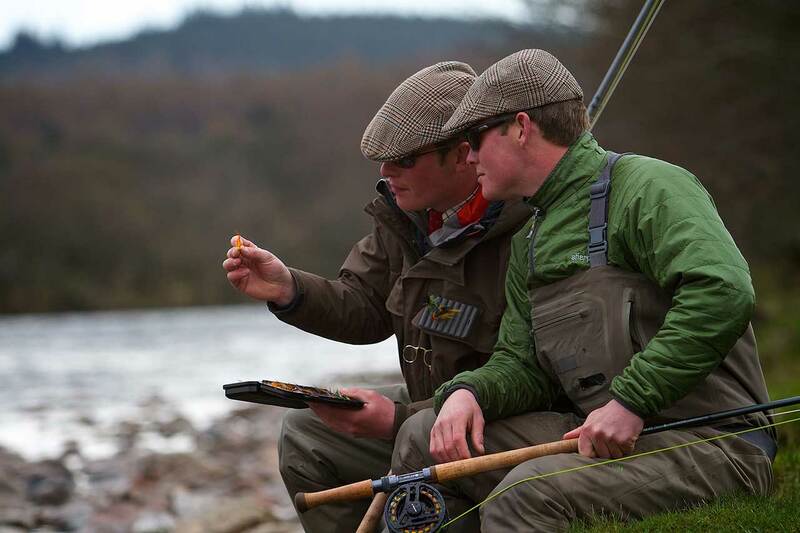 Scotland truly has a river to suit even the most discerning of salmon angler’s tastes. In the Scottish Highlands, many of the rivers are quite small in size. Often during the summer months, if the water is low, a single-handed rod can be all that is required. These rivers are usually at their most productive from April and May onwards, in terms of spring fishing. During the summer months, these rivers can produce excellent runs of hard fighting grilse and summer salmon. Some of the famous rivers in the Scottish Highlands include the Naver, Thurso, Helmsdale and Brora. If as a salmon fisher, you enjoy fishing on smaller, more intimate rivers, where stealth tactics can often pay rich dividends, then the Scottish Highlands is the destination for you. In central and Southern Scotland many of the rivers are much larger in size. Famous rivers like the Dee, Tay and Tweed offer salmon fishing on a different scale. These rivers produce fresh fish all year round. Many of the rivers in this area enjoy a good spring and summer run and the fishing during the autumn months can also be productive. So, if you prefer fishing on larger salmon rivers, there are also plenty of locations to choose from. It is therefore easy to see why In Scotland, there is a river to suit every angler’s tastes. The vast majority of salmon fishing beats in Scotland are private. This ensures that only a limited number of anglers can fish at any one time and that the banks are very well maintained. Therefore, there is very rarely a stretch of water which is overcrowded. The great advantage of this is that anglers have miles of undisturbed water to explore. In addition to this, most of the beats have fantastic facilities for anglers. There are usually well-appointed fishing lodges on each beat. Many of the fishing lodges have running water, toilets and cooking facilities. There is also usually a ghillie on the beat, who is at hand through the course of the day to give anglers guidance on tactics and where the best places to fish could be. The ghillie’s knowledge and expertise can be invaluable and often the difference between success and failure. As we all know; salmon fishing is not just about catching fish. For many anglers it is the locations that salmon fishing takes them to. There are many breath-taking locations in Scotland that you would not know existed unless you were a salmon fisher. What makes salmon fishing in Scotland so special is the stunning backdrop that most of the rivers have. Many of the salmon fishing locations are situated in some of the most remote and serene places. This allows anglers to enjoy the ultimate peace and tranquillity whilst wetting a line. It is not unusual, when salmon fishing in Scotland, that you will not see another soul during the entire day. Often, whilst you fish, the beautiful Osprey, majestic Golden Eagle or timid Red Deer are the only company you will have. Away from the riverbank, the accommodation options in Scotland during a salmon fishing holiday are also second to none. There is accommodation to suit every budget and taste, from luxurious fishing lodges and five-star hotels, to smaller country inns a B & B’s - the options are truly endless. When you combine this with some of the magnificent Scottish cuisine on offer, you have all the ingredients for a perfect stay during your salmon fishing holiday. As you can see, Scotland has a long salmon fishing season. With a multitude of rivers to suit all tastes; private beats with excellent facilities; breath taking scenery and numerous accommodation options - it really does offer the ultimate angling experience for any salmon fisher. The Atlantic Salmon is held in the highest regarded amongst the world-wide fishing fraternity. It is a gamefish which is famed for its power, beauty and intelligence. The salmon has incredible natural instincts and homing skills. These remarkable fish are born in clear fast flowing rivers, and after some two or three years of travelling downstream, they enter the sea. A salmon can spend anything from two to four years in the sea travelling thousands of miles up towards the rich feeding grounds close to Iceland. During this time, the fish will feed prolifically and rapidly gain weight. The salmon then make their arduous journey back to the same river they were born, to spawn. When these fish enter fresh water, they stop feeding, and this is what makes the Atlantic Salmon such a challenge to catch by rod and line. Logic would suggest that is very difficult to catch a fish which is not feeding, and this, of course, is the case. This is why catching one of these fish is such an incredible achievement and why people from all over the world are passionate about chasing wild Atlantic silver. When the salmon enter the river after making their mammoth journey back from the sea, they can range from anything between six and forty pounds. These magnificent creatures then run upstream to the headwaters of the river system, close to the exact place they themselves were born, to find a partner and then spawn. The time of spawning is water temperature dependent and usually occurs in Scotland in November and December. The fertilised eggs normally go on to hatch in April and May of the following year. After spawning, the majority of the adult fish die, however a small percentage do make it back to the sea. These fish then start feeding again and return after another four years to repeat the process. It is while these fish are running upstream to spawn that the angler has a chance of catching them but, of course, this is easier said than done. Atlantic Salmon can enter the river at any time of year, and a lot depends on the country itself. For example, in colder countries like Norway, Sweden and Russia, the majority of fish enter the rivers from June onwards and run through until late September. This is simply because the majority of these rivers which are located so far north in Europe are usually frozen during the early spring and late autumn months. The salmon’s behaviour depends a lot on water temperature and if the river water temperature is colder than the sea, they are unlikely to enter the river until it warms up. In Scotland however, salmon enter the rivers almost all year round which makes it one of the world’s best Atlantic Salmon fishing destinations. Of course, there are certain times of year where more fish run than others, and it is during these times that you stand the best chance of making contact with one of these magnificent fish. Usually, the biggest runs of salmon in Scotland are from April through to October, which gives the angler a large window of opportunity. As already mentioned, the best times of year to catch salmon vary significantly depending on the country. In Scotland, the salmon fishing season starts in either January or February (depending on the individual river) and runs through to November. The time period between the beginning of the season until the end of May is termed as “spring fishing”. Salmon entering the river at this time of year are known as “springers”, for obvious reasons. These are much sought-after fish, revered for their large size and fighting qualities. 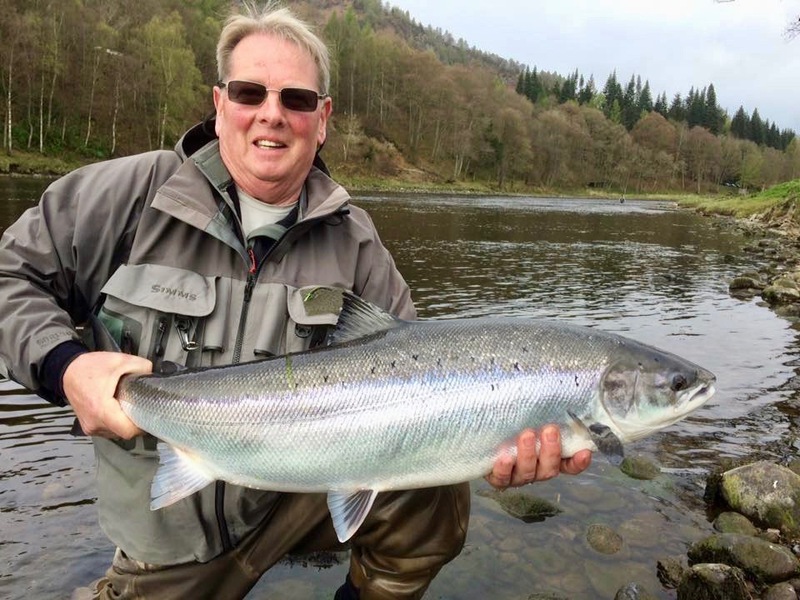 Anglers from all over the world come to Scotland during this time to catch spring salmon. These fish can be so powerful that they often give the visiting angler an unforgettable fight and an experience that they will crave, year after year. Salmon fishing, especially during the early spring months, can be challenging, as often the fish can be few and far between. Some of the spring fish are large and can range from anything between eight to forty pounds in weight. If you are lucky enough to catch a fish early in the season, the hard work and perseverance is well worth the effort. 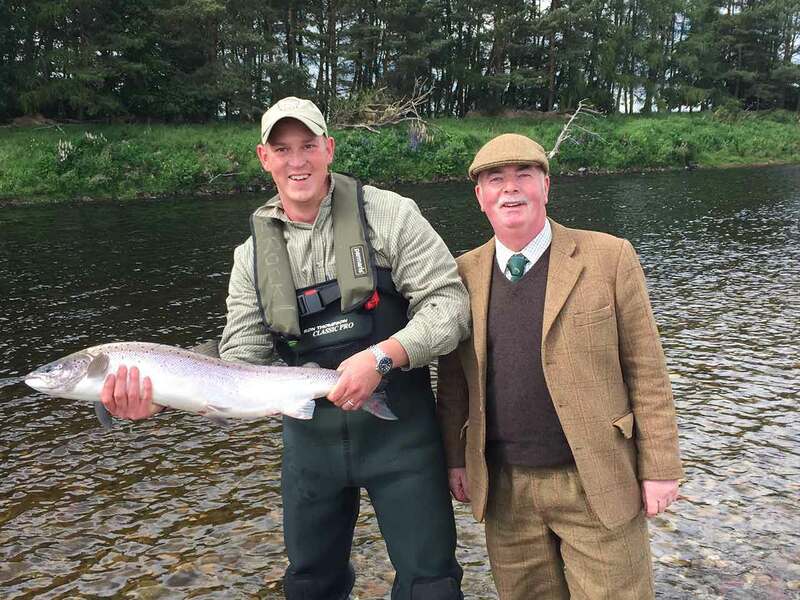 The numbers of spring salmon entering Scottish rivers usually peaks in April and May, which make this time of year a prime time to catch a springer. There are some rivers that have a reputation for being more productive during the spring months than others. In Scotland, rivers like the Dee, Tay and Spey are all famed for producing big runs of spring salmon, which make them the ideal location to catch one of these elusive creatures. Traditionally, the summer season begins in mid-June and runs through until the end of August. At this time of year, the size of fish entering the river are generally smaller. Many of the fish are known as grilse. Grilse are smaller fish that have spent only a couple of years feeding out at sea before returning to the river to spawn. These fish can range from anything between four and eight pounds and are terrific fighters. In addition to the grilse, there are also larger salmon that enter the river at this time of year. These fish often weigh well into the teens of pounds and can be multi sea-wintered fish. The runs of summer fish usually peak in July and August, although a lot depends on the individual river and the weather and water conditions that year. 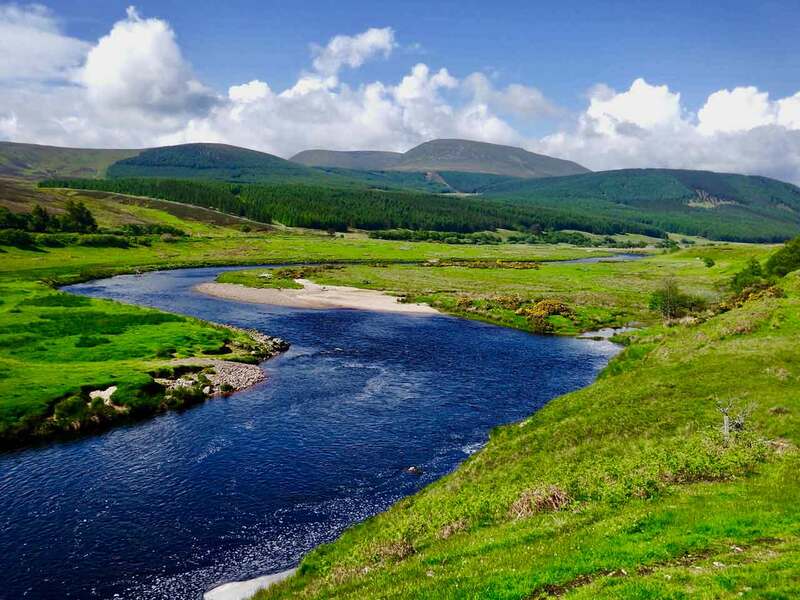 Prolific rivers during the summer months in Scotland include many of the Highland rivers like the Thurso, Helmsdale and Naver. Also, rivers in central Scotland like the Tay, Esk and Teith can be productive at this time of year. The autumn fishing in Scotland is classified from the beginning of August until the end of the season. At this time of year, the fish that enter the river are usually bigger than the summer fish. Traditionally, it as it this time of year when big runs of salmon enter many Scottish rivers. Often it can be the most productive time of year, as there are already spring and summer fish in the rivers and numbers increase as the late running fish join them. Autumn fish entering the river can range from anything between ten and thirty pounds. Rivers like the Tay, Tweed and Teith have an excellent reputation for producing fresh hard fighting autumn salmon. During the salmon fishing season, there are certain times of the year which are more productive than others. It is therefore important to carefully consider the time of year you come to Scotland, as well as the river you will be fishing. By doing this, you will have the best chance of making contact with an Atlantic Salmon. It is all very well knowing about the most productive times of year to come salmon fishing in Scotland but how do you go about catching a fish that does not feed in freshwater? Firstly, you have to remember that when it comes to salmon fishing the fish do have a say! There can be hundreds of salmon in the pool that you are fishing, but if they are not in the mood to take, they cannot be caught, no matter what you do. It is also worthwhile remembering, that on certain rare occasions, salmon can be easy to catch. This is often when the fish are fresh in from the sea and are in an aggressive mood. There are a number of theories around why a fish that does not feed in freshwater may go on to take a fly or lure. These include the salmon being aggressive, playful or inquisitive. The salmon may also be quite territorial especially close to spawning time and if a fly or lure comes close into its vicinity, it may take. The most traditional, widely respected and commonly used method to fish for Atlantic Salmon is with a fly. There are other methods that are used, which include spinning. In the past prawn and worm fishing was also permitted. In Scotland nowadays, the majority of anglers fly fish with the odd person spinning. There is no greater feeling in fishing than to catch an Atlantic Salmon on the fly. The directness of the take and the sheer power of the fight are just a couple of reasons why it is so special. In terms of tackle, when it comes to fly fishing for salmon in Scotland, a double handed fly rod is what is required on most occasions. Double handed fly rods can range in length from anything between twelve to sixteen feet. The length of the rod that you need, depends a lot on the size of river that you will be fishing, and also on the time of year you are most likely to be fishing. Usually a fifteen-foot fly rod is more than adequate when fishing in Scotland and it will cover almost all eventualities. A longer rod allows you to cover larger rivers more effectively and less effort is needed when casting. However, longer rods are not always the answer. 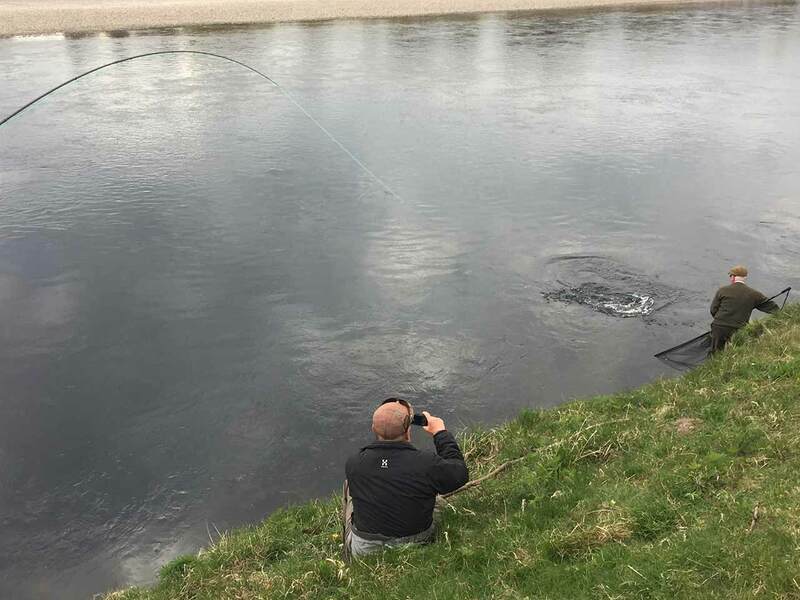 If you are fishing on a smaller river in the Scottish Highlands, a longer rod can cast a shadow over the water especially in low water and this can spook any fish in the pool. In such circumstances, it can often be more beneficial to use a smaller double handed (switch rod) or even single-handed rod. During the spring months, larger, heavier flies are usually used and therefore a longer, more powerful rod is often required. Conversely, in the summer when the water is lower, the flies used are usually smaller and then a shorter rod would suffice. Each fly rod has a line rating and it is important that when you purchase a fly line it matches the rating of your rod. To achieve maximum casting distance, it is vital that the fly rod and line work in perfect harmony. Fly lines not only come in various weights but also in various types and sink rates. In recent years Spey casting has become much more fashionable. There are many fly lines which are specifically designed for Spey casting. If you are a beginner to the sport, it is always worthwhile getting a few Spey casting lessons and advice before buying a salmon fishing outfit. There are also fly lines which vary greatly in sink rate. To keep things simple, a fly line can be either a floating line used to present the fly just under the surface of the water, an intermediate line or a sinking/fast sinking line. The line that is required depends a lot on the time of year that you are fishing, as well as the water temperature. During the spring months, when the water is cold and the fish are often lying close to the riverbed, a sinking line may be appropriate. However, when the water is warmer during the summer months, the fish often lie close to the surface and in such conditions a floating or intermediate line may just be what is required. 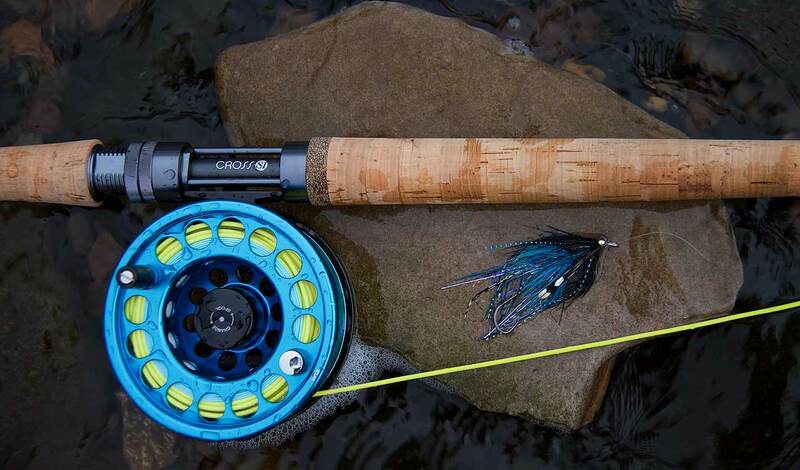 When it comes to fly reels, there are also a few things to consider. Firstly, you want to make sure that you have a reel that has a good reliable drag system. The Atlantic Salmon is a powerful fish and during a long hard fight you often need a decent drag to control the fish. You also want to make sure that your reel has an adequate line and backing capacity. Salmon when hooked can run long distances in a matter of seconds, and so you want to make sure that you do not run out of line, as this will only end in disaster! So far, we have looked at rods, reels and lines when it comes to the tackle required to fly fish for salmon but what about the leader material and flies? A good quality nylon with a breaking strain of anything between ten and eighteen pounds is usually recommended, depending on the time of year. During the spring months the fish are usually bigger, and the flies that you are most likely to be using are heavier, therefore nylon with a breaking strain of fifteen pounds is often required. If, however, you are fishing during the summer months when generally the fish are smaller, as are the flies, a nylon of lighter breaking strain is likely to produce the best results. Which fly to use is one of the most commonly asked questions among salmon anglers. As with many things when it comes to salmon fishing, there is no exact science behind choosing flies. A lot depends on personal preference and confidence, and also the time of year. Salmon flies come in many weird and wonderful colours. Most of the commonly used fly patterns have a name. 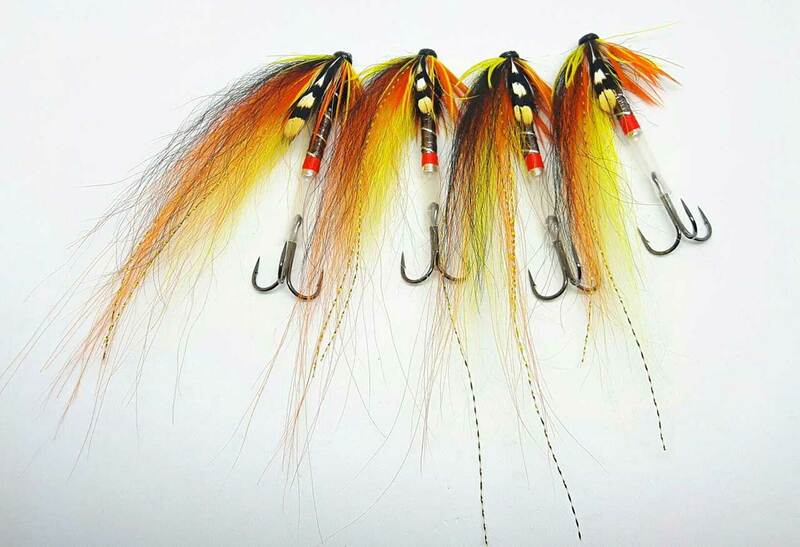 Salmon flies also vary in style from the traditional dressed fly which is tied on a single, double or treble hook, to the tube fly, which can vary greatly in length and weight. Which fly should I use? As a general rule, when the water is high and cold (usually during the early spring months), a fly which is of a decent size, so it is highly visible in the water is recommended. In addition to this, it may also be desirable that the fly sinks quickly and moves close to the riverbed, as when the water is cold, the fish often lie close to the bottom. A tube fly, which can range from anything between half an inch to two inches in length can be perfect for the job. The added advantage of a tube fly, is that its body can be made from various materials which differ greatly in weight. These include, aluminium, copper, brass and tungsten (the heaviest). Productive tube fly patterns include the Willie Gunn, the Cascade and the Posh Tosh, amongst others. So, when the water is cold and high during the early part of the season, a large heavy tube fly is often all that is needed. In the summer when the water is warmer, smaller dressed flies come into their own. Usually at this time of year the water is lower and warmer, and the fish lie closer to the surface. Smaller, subtler dressed flies like the Stoats tails, Ally’s Shrimp and Flamethrower can be particularly effective in these conditions. In terms of size, anything between a size eight and twelve, depending on water height, is more than adequate. When it comes to choosing fly styles and patterns for autumn fishing, a lot depends on the weather and water conditions. If the water is high and cold (similar to conditions in the early spring) then it is usually better to opt for larger flies, maybe even tube flies. Conversely, if the water is low and warm, it is the smaller flies that can be the most effective. During the summer months, these produce the best results. You now know, where and when to salmon fish in Scotland and also what tackle and flies are required, as well as, having an insight into what tactics work at different times of the year. To learn how to fly fish down a salmon pool please click on the section of our guide titled: A detailed explanation of exactly how to fly fish down through a Scottish salmon pool. So far, we have looked at fly fishing for salmon, but as already mentioned, there are other methods that can be used. Shrimp fishing is no longer permitted on most of Scotland’s rivers, but spinning does remain a popular alternative to fly fishing. A number of rivers in Scotland allow anglers to spin for salmon and these include the Tay, Ness, Teith, Spey (on selected beats) and the River Tweed (at certain times of the year) amongst others. Spinning for salmon can be particularly effective in certain conditions, especially if the water is high and coloured. Many fly fishing purists often frown at anglers who spin, as they feel spinning for salmon requires less skill. This is unfortunate, as spinning is a legitimate method for catching salmon and it can be a difficult art to perfect. To spin for salmon, you need to use a different type of rod and a fixed spool reel. These rods are usually much shorter (around ten feet in length) and are capable of casting heavy lures, which can weigh anything from ten to forty grams. The great advantage that spinning for salmon has over fly-fishing, is that you can cover more water. The lure can be cast a greater distance than the fly. This can be a big advantage, especially if you are fishing when the water is high or on a larger river like the Tay or the Tweed. When spinning for salmon, it is important to have a robust rod which can comfortably cast lures of different weights. The most commonly used reel for spinning is a fixed spool reel. 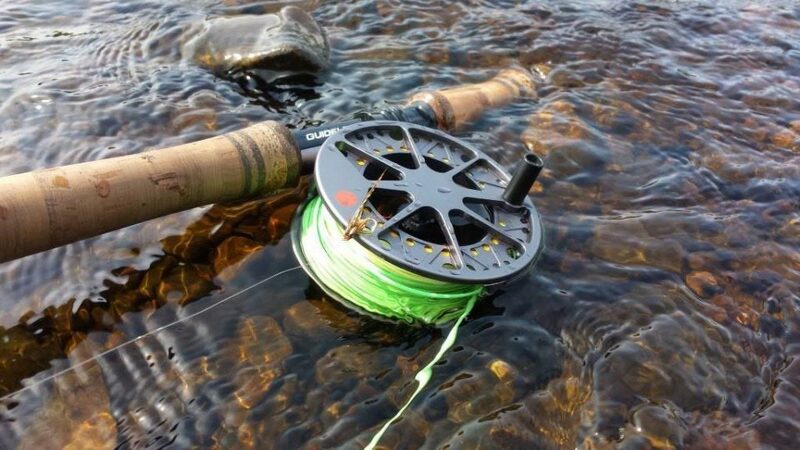 It is important that the reel has a decent and reliable drag system and also a good line capacity. The reel is usually filled with nylon which has a breaking strain of around fifteen pounds. There are many different types of lure that can be used for spinning. They all have different actions in the water but are fished in a similar way. After casting these lures, usually a slow, steady retrieve is performed, which will result in the lure moving through the water at the correct depth and speed. When it comes to selecting the weight of the lure, you need to consider the time of year you are fishing as well as the water temperature, current and depth. When the water is cold and high during the early spring months and often in autumn, you may opt for a lure which is heavier, as it will go down through the water column quickly. As the fish are likely to be lying close to the riverbed, the heavier lure is perfect. In terms of the speed of retrieve, you would want to perform this as slowly as possible, without the lure getting snagged. This will ensure that your lure will be moving as deeply and slowly as possible, which is key when spinning for salmon in cold water. Often, if you can accurately select the weight of the lure by carefully taking into consideration the depth and current of the pool, then you should be able to cast your lure and let it swing around naturally in the current without retrieving. In such circumstances, the strength of the current will move the lure for you. Once your lure swings into the near bank, you can retrieve quickly, take a couple of paces downstream and repeat the process. During the summer months the water is usually warmer and lower so lighter lures can often be the order of the day. With the warmer water temperatures, the salmon are usually more active and can often be more inclined to follow and chase a lure. In such conditions, retrieving a lighter lure faster can often work well. The fish are likely to be lying closer to the surface and happy to follow a fast-moving lure before taking it. Probably the most popular and productive lure when spinning for salmon is a Spoon. There are various different types of Spoon on the market including the Toby, Salmo Toby and Blair Spoon amongst others. These lures are usually made from metal and are highly visible in the water. The visible nature of the spoon coupled with its irresistible wobbling action makes it one of the most successful salmon lures in history. In the water, the spoon is meant to resemble a small injured fish. After casting, by performing a slow steady retrieve, the lure starts wobbling through the water which is what gives the spoon its action. If there is enough depth and current in the pool that you're fishing, then often after casting, the spoon can be left to swing around in the current naturally. Spoons are easy to use and come in various weights and colours. The simple silver or copper colours seem to work best. These lures work well all year round from early spring through to the autumn months. The key, when fishing with a spoon, is selecting the correct weight of lure, and as already mentioned earlier, this will depend on the time of year you are fishing, as well as the current and the depth of the particular pool. When it comes to fishing with a spoon, a slightly downstream cast is usually made and either a slow retrieve is performed, or the lure is allowed to swing around naturally in the current. If the water is warmer, during late spring or summer then sometimes an upstream cast coupled with a fast retrieve can also be quite productive. This works well when the fish are more active. Another successful spinning lure is the Devon Minnow. The devon is shaped like a fish and is much subtler in appearance compared to the spoon. 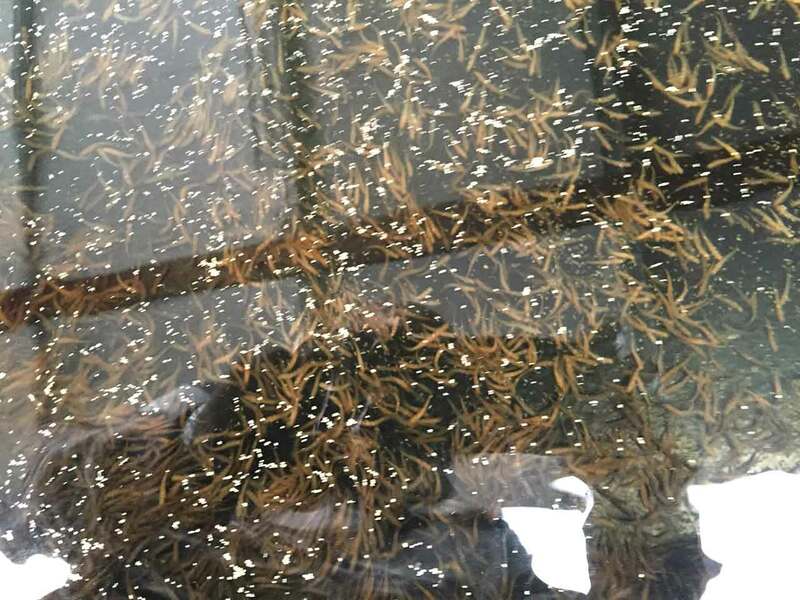 Devon Minnows can either be made from metal or wood, with the wooden versions being copper lined. These lures are meant to resemble small fish, like minnows, in the water. They have a very smooth spinning action in the water and they come in various colours, weights and lengths. Green and yellow, and black and gold, seem to be very popular colour combinations. The same principles apply when fishing with a devon, as they do with a Spoon, in terms of the weight of the lure. Therefore, in high, cold water you may use a heavier, longer lure, so it is more visible to the salmon as it moves through the water close to the riverbed. Similar to fishing with a spoon, it is important to select the correct weight of lure for the pool, then making a slightly downstream cast before performing a slow retrieve. If there is enough current the devon can be left to swing around naturally in the current. The Devon Minnow seems to be particularly effective during the spring and autumn months. The Flying Condom, more commonly known as the Flying C, is another excellent lure used for salmon fishing. This lure consists of a weighted body which is encased in rubber. At the front of the lure there is a small blade which rotates as the lure is being retrieved. These lures also come in various weights and the colour of the tubing can vary greatly. One of the most popular colours is black, coupled with a copper blade. These lures are fished in a similar way to the spoon and devon, as after casting they should be retrieved slowly. The Flying C is a particularly effective lure during the late spring and summer months. Like the spoon, the lure can work well when cast upstream and retrieved quickly. The Rapala or Vision110 type lures are relatively new on the market. They are becoming ever more popular among anglers. These lures have quite a different action compared to the other lures that we have discussed so far. They are meant to represent injured fish as they move through the water. These lures are usually made from plastic and are quite light. Located at the front of these lures is a small vein. As the lure is retrieved, after casting, the current pushes against the vein. This makes the lure dive and produce a fantastic pulsating action. These types of lures come in various lengths and colours. Some even have ball bearings encased in the body to add extra weight. This not only makes it easier to cast the lure greater distances, but when retrieved through the water, the ball bearings produce a rattling sound, which can make the lure a more enticing prospect. The main difference when fishing with these lures is that they have to be retrieved after casting as this is what gives them their action. They usually cannot be left to swing around naturally in the current, as they will float on the surface of the water. The Rapala or Vsion110 is usually cast slightly downstream before a slow steady retrieve is performed. We have already touched on the techniques used to spin for salmon. Usually, anglers will start fishing at the head of the pool, cast ever so slightly downstream and then perform a slow steady retrieve. This method can be used when fishing with all of the lures above. If there is enough current in the pool and you have judged the weight of lure correctly, then when using a spoon or a Devon Minnow, the lure can be left to swing around naturally in the current. Once the lure swings into the near bank, it is retrieved, two steps are taken down the pool, and the whole process is repeated, until the entire pool has been covered. 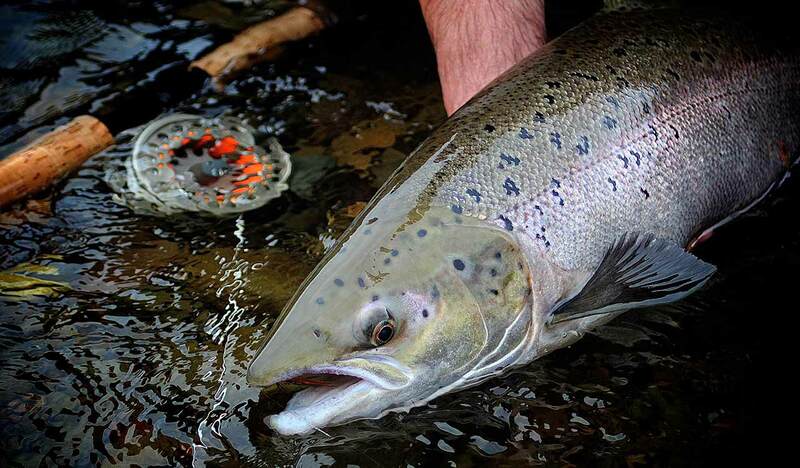 Whether you choose to fly or spin fish, it is never easy to catch an Atlantic Salmon. How can it be, as you are fishing for a fish that does not feed in fresh water? By having some understanding about the life cycle and behaviour of the salmon, as well as knowing about the most productive times to fish can only help. If you combine this knowledge with having a basic understanding of tactics, and the best times of year to use these tactics, then when it comes to both fly fishing and spinning you considerably increase your chances of making contact with one of the most prized fish on our planet! When it comes to booking a salmon fishing holiday in Scotland, the options are truly infinite. One of the major advantages of salmon fishing in Scotland is that the fishing season itself is so long. The season extends from mid-January through to the end of November, allowing the visiting angler to fish for salmon in Scotland eleven months of the year. Fresh hard fighting salmon are caught from Scottish rivers each month of the fishing season, so there is a good chance of catching a fish regardless of the time of year. There are also so many wonderful prolific rivers to choose from, which vary greatly in size and character. Many of these rivers are set in beautiful and tranquil locations, where you can feel at one with nature, whilst casting your line. Often during your day’s salmon fishing, you will not see another human being, instead having red or roe deer grazing close by, and Golden Eagles soaring high overhead for company. If you enjoy salmon fishing on smaller rivers, then the Scottish Highlands is the place for you. The Scottish Highlands offers the visiting anglers a myriad of smaller rivers to explore, which are set on spectacular, remote and rugged, scenic backdrops. These rivers can yield high numbers of salmon during the late spring and summer months. Prolific rivers in the Scottish Highlands include the Navar, Thurso, Helmsdale and Oykel amongst many others. Often when the water is low on these rivers, only a single handed or switch rod is required. The waters of these rivers can be quite clear, so using stealth tactics can pay rich dividends. If you prefer fishing on larger rivers during your salmon fishing holiday, you are also spoiled for choice, as there are many to choose from. 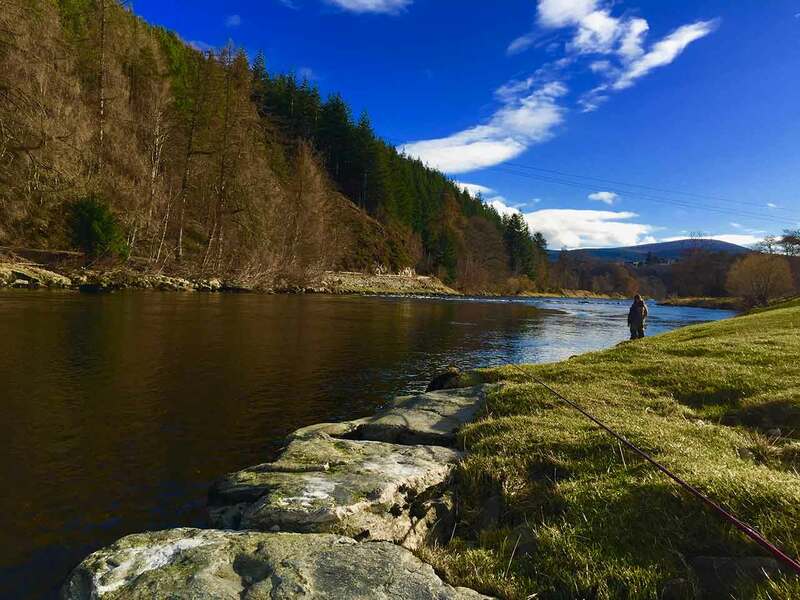 Rivers like the Dee, the Spey and the Tweed are much larger in size compared to many of their Highland counterparts, offering the visiting angler quite a different challenge and angling experience. The River Tay in Perthshire, is also another large river, being the longest in Scotland. It has a reputation for producing big fish. Each year fish of over thirty pounds are regularly caught from this river. The River Tay produces decent numbers of fish throughout the season which makes it a very popular choice with holidaying salmon fishers. As Scotland is a relatively small country, it is possible to experience salmon fishing on two or three different rivers during your holiday. This gives you a taste of what it is like to fish in different locations and also experience more of the wonderful scenery the country has to offer. Another great advantage of fishing in Scotland is that the facilities for salmon anglers is second to none. Almost all the beats (stretches of water) are private. This means that only a certain number of anglers can fish a particular stretch of water at any one time. This ensures that anglers have plenty of space to fish and also have a wide variety of pools to choose from throughout the day. 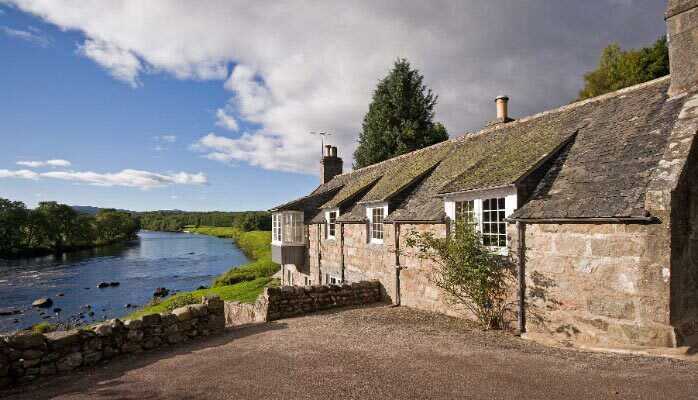 Most of the salmon fishing beats in Scotland have excellent fishing lodges located by the river for anglers to use, as well as having a ghillie. The ghillie is there to help and give advice to anglers that are fishing the beat, and often their expert guidance can make the difference between success and failure. Away from the riverbank, there is a wide range of accommodation options for visiting anglers, to suit all budgets and tastes. There are some fantastic Bed & Breakfast and Guest House lodgings to choose from. Alternatively, if you prefer larger five-star hotels there are no shortage of these establishments either. Many anglers prefer to stay in self-catering lodges or chalets. Many of these are located close to the riverbank, offering spectacular views of the stunning countryside. In Scotland the accommodation options are truly endless. The food and drink on offer in Scotland is first class. As we all know, the dining options on offer can often make or break a holiday. It is just as well then that there is no shortage of delicious eateries in Scotland. There are numerous excellent restaurants to choose from, as well as wonderful artisan delicatessens which sell Scottish cheese, cold meats and, of course, our famous haggis. There is also no shortage of our world famous Scottish whisky. There are a multitude of distilleries producing delicious malts, each with their own distinct flavour. There is no better way to celebrate catching a hard-fighting Scottish salmon than with a fine Scottish malt at the end of the day. Salmon fishing is just one of the many activities Scotland has to offer. Scotland is the perfect destination if you wish to pursue other interests along with salmon fishing during your holiday, or even if there are non-fishers in your party. The scenery across the country is to die for, and there are many sight-seeing tours on offer. Some of the scenery in the Scottish Highlands is in a class of its own. There are also an abundance of white sandy beaches to explore, as well as the famous Loch Ness. If you are passionate about history, Scotland has an infinite number of Castles to visit. For visitors that enjoy more active pastimes, Scotland caters perfectly for those who love mountain biking and skiing and is also home to a number of Championship Golf Courses. 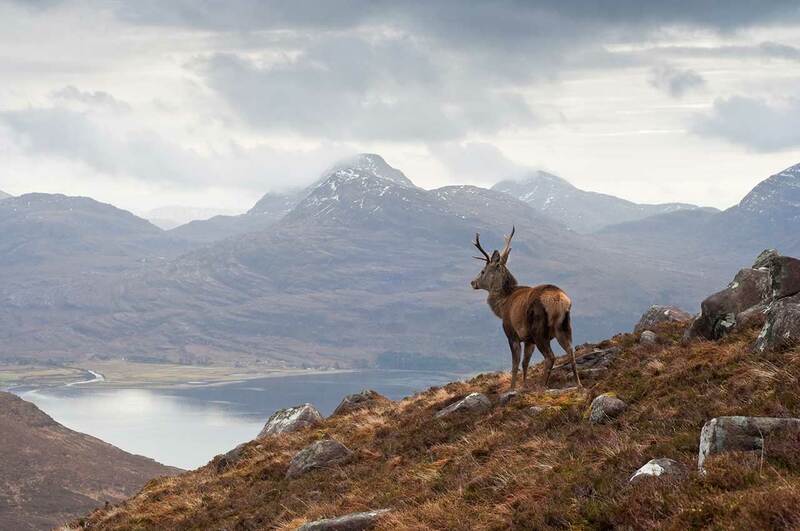 For game sport enthusiasts, Scotland boasts some of the best Red Deer stalking in the world. If you are visiting Scotland as part of family holiday, there will be no shortage of things for everyone to do, away from the riverbank. It is easy to see why people travel to Scotland, from all over the world, for their salmon fishing holiday. 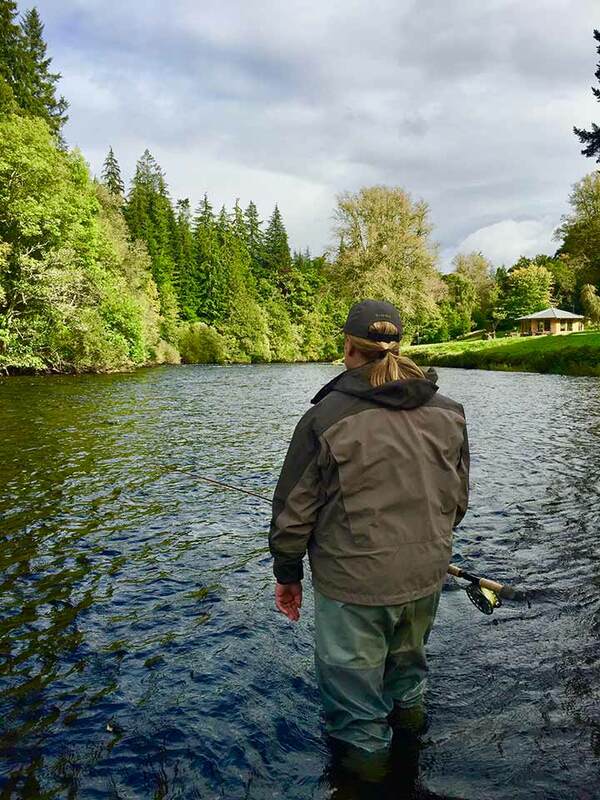 A wide array of rivers to choose from, spectacular scenery, excellent facilities for anglers, private beats, great accommodation options and a multitude of other activities are just a few of things that make a salmon fishing holiday in Scotland one experience that you will never forget. There is no greater feeling than introducing the younger generation into our sport. Many people that have enjoyed the pastime of salmon fishing, or any fishing as a matter of fact, were first introduced to the sport by a parent or close family member. This is often where that initial spark of passion is ignited. 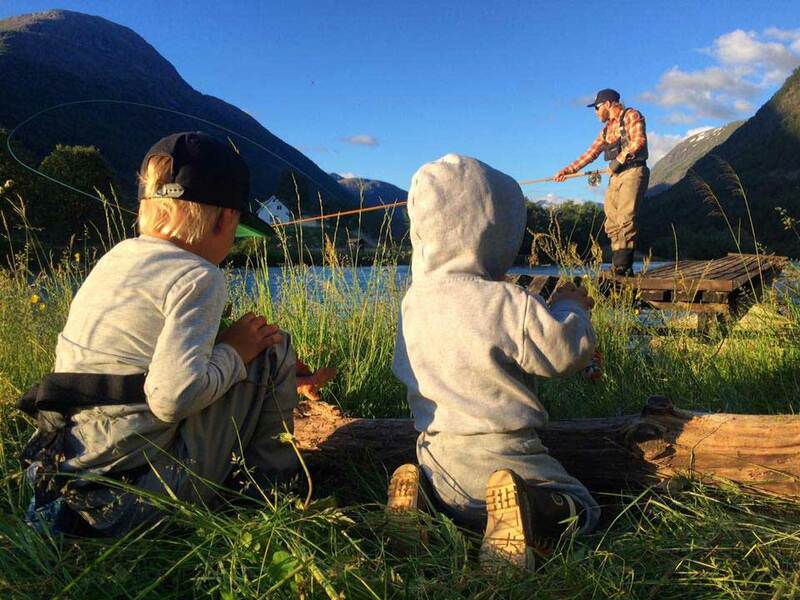 Salmon fishing is a great vehicle which can be used to spend quality time with your children. In the modern age of new technology, the fishing rod still remains the best joy stick on the planet and is better than any games console for entertainment. Salmon fishing can teach our children so much, as the skills and disciplines learned from the sport can be mirrored in life. Patience, perseverance and respect for the fish are all important, when it comes to salmon fishing and these virtues are vital for our children to learn. Salmon fishing is a fantastic pastime for children to experience, as it brings them into the great outdoors, enjoying the fresh air. It also has the added bonus of getting kids close to nature and learning about how important it is to respect the environment they live in. The key to getting children to enjoy salmon fishing is by letting them experience what it feels like to hook a fish. If this happens quickly, then all the better. When children are young, they are often looking for instant gratification and if they can feel their rod bend during the first few times they go salmon fishing, they can often be hooked for life. It can therefore be better if they begin with spinning for salmon. The technique of spinning is much easier to master and learn, compared to fly fishing. Usually after just around fifteen minutes of tuition, most people are able to cast a spinning rod competently and well enough to cover a salmon. If they then enjoy the experience and catch fish on a regular basis, they can then be introduced to the art of fly fishing. When it comes to any sport, safety is paramount and all children under the age of sixteen should be closely supervised by an experienced adult. Rivers are dangerous places, and it is important that anyone that ventures close to the riverbank is wearing a buoyancy aid at all times. It is also important that the experienced adult accompanying a child, knows the stretch of water that they are fishing well, and is aware of the depth and current in the pools. It is always better not to wade and if it is necessary, to keep wading to a minimum. If there is a resident beat ghillie, it is very important to listen to his safety advice, as ghillies will know their water and pools intimately. In Scotland there are some fantastic opportunities for children to experience salmon fishing. There are a number of angling associations across the country which offer under sixteens discounted season permits on some famous rivers. Most of the rivers in Scotland have a stretch of Association water for locals to salmon fish, and this is a great place for children to start their journey. Many of these beats can be quite prolific depending on the time of year. Rivers like the Thurso, Helmsdale, Dee, Spey and Tay amongst many others all have good beats which are controlled by their local angling associations and offer children great discounted fishing. Many private beats also have excellent facilities which are suitable for children. Almost all of the beats have a fishing hut and ghillie available for anglers. As the wading on different beats can be variable it is always better to select a beat with easy wading for children and one which is safe. This usually means where the riverbed is smooth and there are no sudden depth changes. It is also important that the riverbank is well maintained and clear of any obstacles that may cause a stumble, or long grass which could entangle lines and little feet. There is no better pastime to introduce children to than salmon fishing, as it teaches them values that are important in everyday life. The fact that there are so many famous rivers in Scotland which have beats which are regulated by angling associations, offering heavily discounted season tickets for children, is fantastic for the next generation of salmon fishers! When you couple this with some of the private beats allowing children under a certain age to fish for free when an accompanying adult is fishing, it is easy to see why Scotland is the perfect country to introduce children to the joys of salmon fishing. Edinburgh is Scotland’s capital city, and it is also home to one of Scotland’s major airports. With regular flights to and from most major UK cities, and also Europe and America, it is a very popular airport to fly into when beginning your salmon fishing holiday in Scotland. 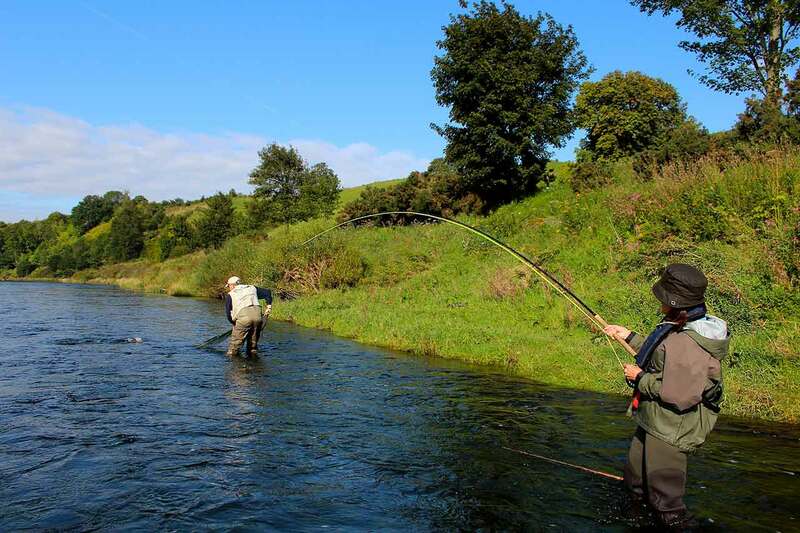 There are a number of excellent salmon fly fishing venues within easy reach of Edinburgh. Many of these are no more than an hour away by road. Each of the nearby rivers offers the visiting salmon fisher something quite different. Often anglers living in the south of England can arrive in Edinburgh on the first flight of the morning, enjoy their day’s salmon fishing, then fly back home by the end of the day. Probably the three most bountiful salmon rivers which are located close to Edinburgh are the Tay, Teith and Tweed. All these rivers offer exciting fly fishing opportunities for salmon throughout the course of the season. 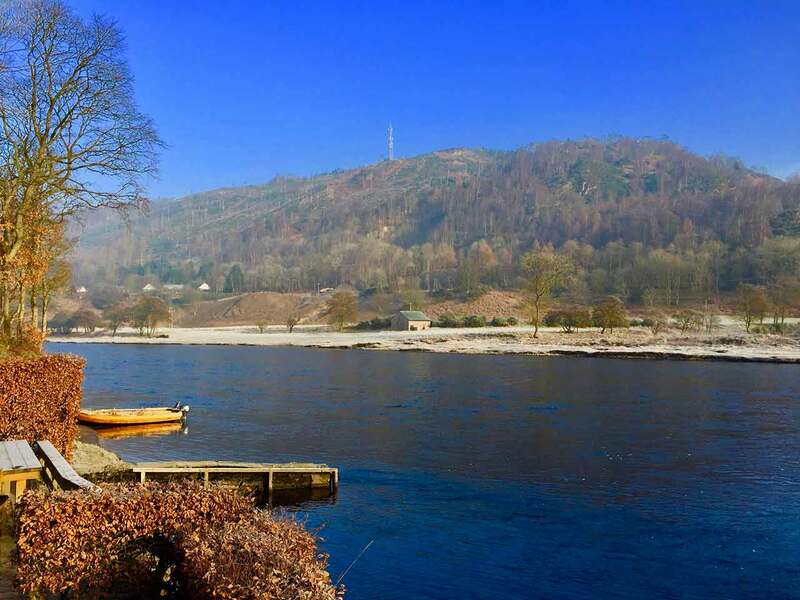 The River Tay is located in beautiful Perthshire. It is no more than an hour’s drive from Edinburgh. The Tay is one of the most prolific salmon rivers in Scotland and has a reputation for producing big fish. 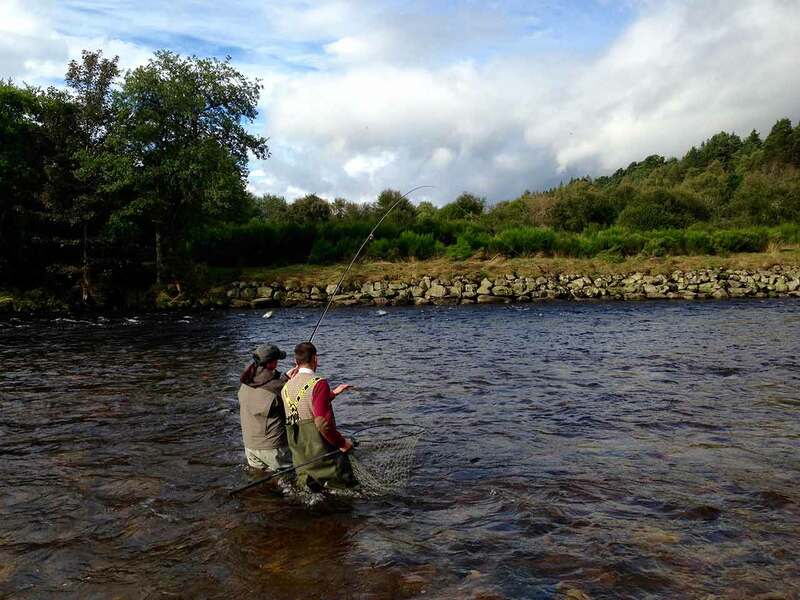 The salmon fishing season on the River Tay extends from mid-January through to the middle of October. There is some fantastic fly water on the River Tay, with some truly mouth-watering pools. 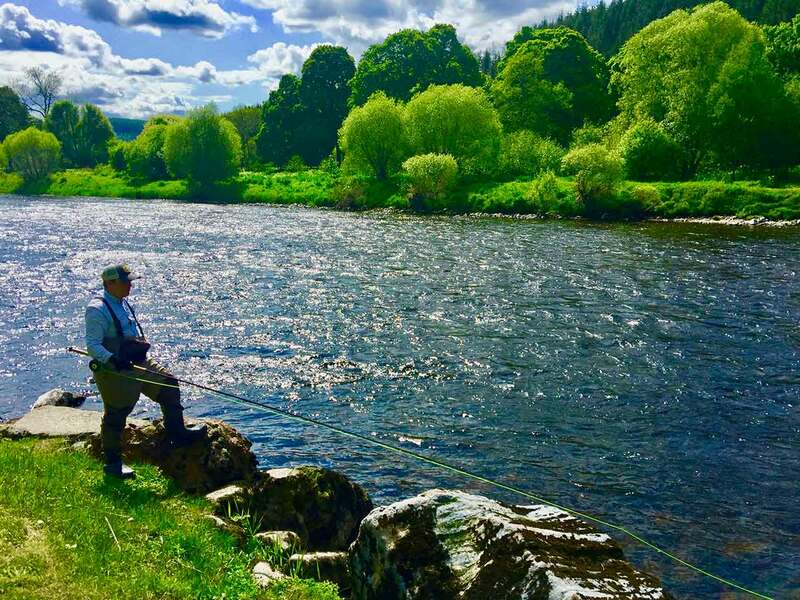 The best times for fly fishing on the River Tay is between April and May, and then again from July through to September. If you are a keen fly fisher and prefer a salmon fishing venue close to Edinburgh, then the River Tay is definitely worth considering. The River Teith runs through the heart of Stirlingshire and is another one of Scotland’s famous salmon rivers. The river is only around forty-five minutes’ drive from Edinburgh, making it easily accessible to anglers. The Teith is much smaller in size compared to the River Tay but can be just as productive. The salmon fishing season on the River Teith commences in early February and extends through to the end of October. The Teith produces decent numbers of spring and summer salmon, however it is probably most famous for its autumn fishing. During September and October, large numbers of fresh salmon usually run the river, and this is often when big numbers of fish are caught. There are a number of fantastic private beats on the River Teith which boast some superb fly water. Very few anglers go home disappointed after a day’s fishing on the River Teith. 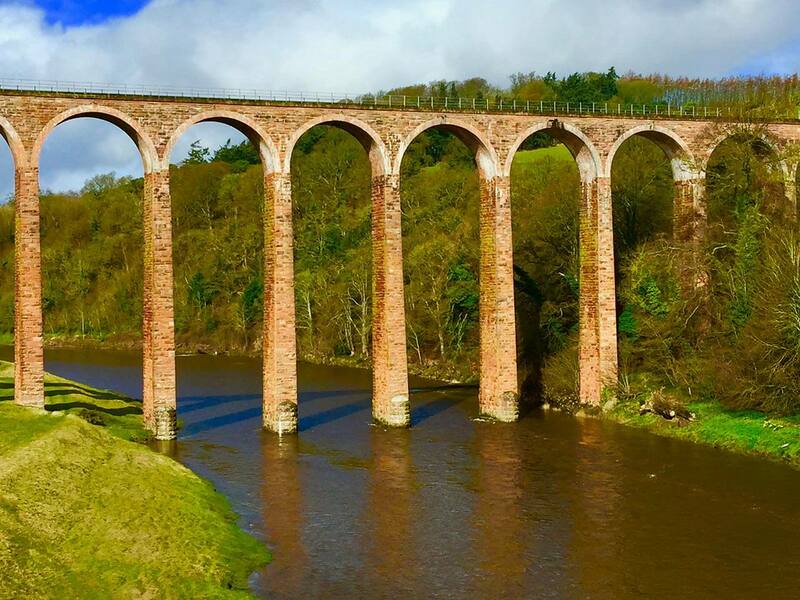 The world-famous River Tweed is Scotland’s most prolific salmon river and is located in the Scottish Borders. The Tweed is only around ninety minutes’ drive from Edinburgh, making it a favoured venue for many of the capitals residents. Like the Teith, the River Tweed opens at the beginning of February, although the season continues until the end of November. The Tweed is one of the very few rivers which has a season that extends so late into the season. Salmon are caught from opening day onwards and anglers usually enjoy some good sport during the spring months. However, the Tweed is probably most famous for its autumn run. 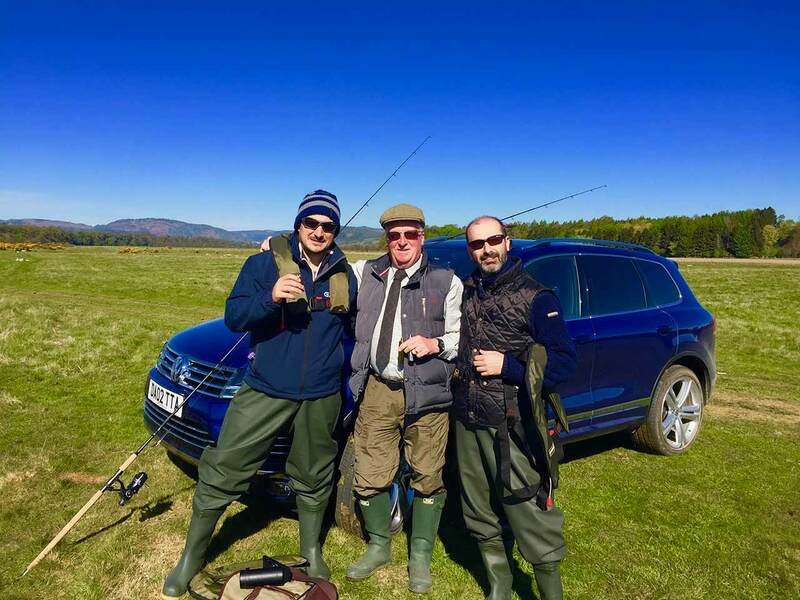 People from all over the world flock to the Scottish Borders to fish for salmon in September and October. At this time of year, big catches can be made from the Tweed and its tributaries. In addition to the salmon fishing, the Tweed also enjoys an excellent run of big Sea trout during the summer months. Double figure fish are not uncommon, and these magnificent fighting fish can provide a welcome distraction to the salmon fishing. So, as you can see, there are a number of excellent salmon fly fishing venues located close to Edinburgh. All of these are easily accessible by road and showcase some of the very finest salmon fishing that Scotland has to offer. So as a fly angler, once you get to Edinburgh, the Scottish salmon fishing world is your oyster! Scotland truly is an angler’s paradise. If salmon are your quarry, then you are truly spoilt for choice. There are so many prolific salmon rivers across the country. These rivers vary greatly in size as well as character and so offer the visiting angler different challenges. With such a long salmon fishing season in Scotland, you have the chance to chase silver for eleven months of the year. If you enjoy fishing for wild Brown Trout, there are numerous beautiful hill lochs situated all around the country, set in some of the most remote and peaceful locations. Some of these lochs are so remote that a good hike is often in order, just to reach them. Many of the fish have never seen an artificial fly before, therefore you are fishing over almost virgin territory. In addition to the loch fishing for Brown Trout, most of Scotland’s rivers also have healthy population of wild fish, which are hard fighting and provide terrific sport. During the winter months there is also grayling fishing in Scotland. These beautiful fish, fondly known as the “lady of the stream”, due to their elegance, are a very popular game fish amongst anglers. Fly fishing for pike is also becoming more popular. Many of Scotland’s beautiful still waters have large populations of hard fighting pike, which can give a fantastic fight, especially on a fly. Away from freshwater, there are also some fantastic sea fishing opportunities in Scotland, whether that be from the shore, or from a boat. Common fish caught around Scottish coastal waters include, Cod, Haddock, Pollock and the giant Common Skate, which can weigh in excess of two hundred pounds. Fishing from Scotland’s beautiful secluded sandy beaches provides a spectacular backdrop for any shore fisherman. There are also a number of charter boat companies that arrange sea fishing trips from a boat. When you are thinking about creating your ideal fishing trip in Scotland, you first need to decide what species of fish you want to target. This can help you choose the location and time of year for your visit. Of course, a lot depends also on whether you are going on a fishing-only holiday, or combining it with some sightseeing and family-friendly fun. There are a number of fishing tour operators in Scotland that can help you design your ideal fishing holiday, so that you can get the best from your break. However, it is important to be aware of the best times of year and locations, to fish for the different species. When it comes to salmon fishing in Scotland, there is no shortage of rivers to choose from. As the season is long, extending from January through to the end of November, it can be hard to decide when and where to go. For many anglers catching a spring salmon is the ultimate prize. Salmon fishing early in the season can be tough, as there are not usually large numbers of fish around at this time. However, the fish during this part of the season are usually big and extremely hard fighting. The prime spring months on most Scottish rivers are usually between mid-March and the end of May. Productive rivers in the spring include the Dee, the Spey, the Tay and the Naver amongst others. 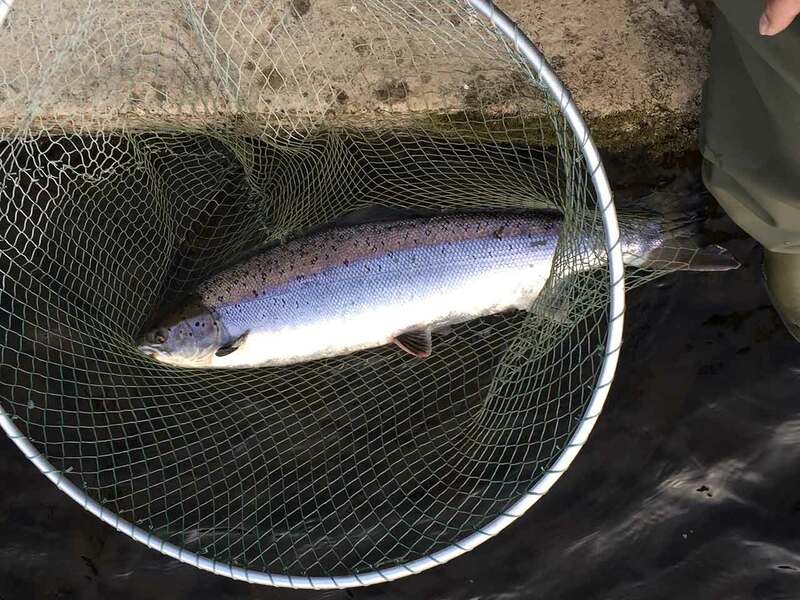 During the summer months, the fish are usually plentiful and there are good numbers of grilse and summer salmon entering most of Scotland’s rivers. The prime summer months are usually from July through to the beginning of September. At this time of year, rivers like the Spey, Thurso, Helmsdale and the Findhorn can produce good numbers of fish. Also, the weather is usually more favourable during the summer months, which makes it an ideal opportunity to enjoy a family holiday, coupled with some fishing. September and October are usually the prime autumn months. At this time of year, often large numbers of fish are caught from many Scottish rivers. The likes of the River Tay, Teith and Tweed are famed for their large runs of late autumn salmon. If you are looking to fish mainly for wild Brown trout during your fishing holiday, then May, June and July are probably the best months to visit Scotland. A lot depends on the individual loch, as once the water temperature begins to rise the trout can be difficult to catch. For trout fishing, the Scottish Highlands is the perfect destination. There are hundreds of remote hill lochs to choose from and many of these produce large hard fighting wild fish. The grayling is another popular game fish in Scotland. These fish reside in many of the rivers in central and southern Scotland. Grayling are caught over the winter months, from rivers like the Tay, Tweed and Clyde, and can provide some fantastic sport for fly fishers during the depths of the Scottish winter. Fly fishing for pike is becoming ever more popular in Scotland. 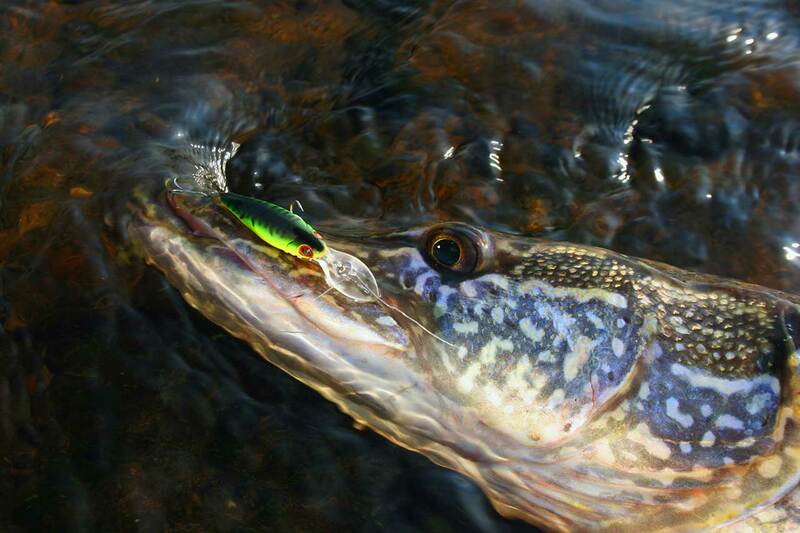 As there is no close season, you can fish for pike all year round. Pike inhabit many of the lochs in central and southern Scotland and there is no shortage of venues to choose from. As you cannot fish for salmon in Scotland on a Sunday, many anglers choose to chase pike instead, and are rarely disappointed. When it comes to sea fishing there is also no close season. People can fish all year round targeting Cod, Mackerel and Pollock amongst many other species. When it comes to fishing for the giant Common Skate, the best times of year are usually late spring and then again in early autumn. These fish are usually caught when fishing from a boat off the West Coast of Scotland. As we all know, when planning your fishing holiday, the quality of the accommodation can often enhance your holiday. 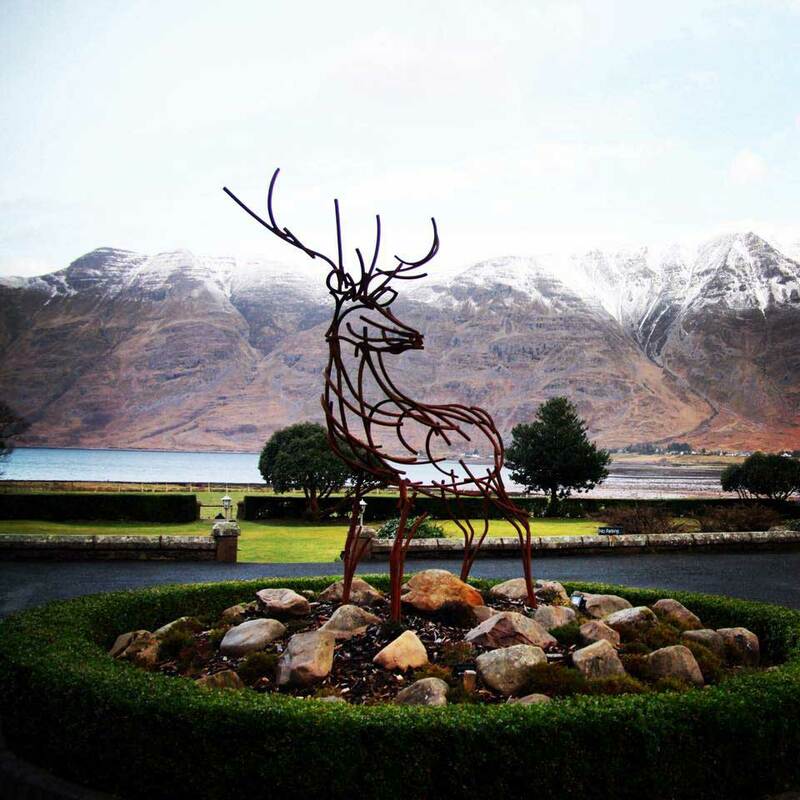 There are so many wonderful accommodation options in Scotland to choose from, whether you are looking for a small family run B & B or a luxury five-star hotel, the options are endless. There are also a number of beautiful self-catering accommodations, lodges and chalets available. If you are on a family holiday, it is important to make sure there are plenty of activities for the non-fishers in your party. If fishing is the main pastime during your holiday, try not to stay too far away from the fishing venue itself. In terms of dining, there are also plenty of options. Scotland has endless fantastic restaurants, bistros and bars which serve good local fare. There is no shortage of good places to eat when you come to Scotland and some of the food on offer is second to none. 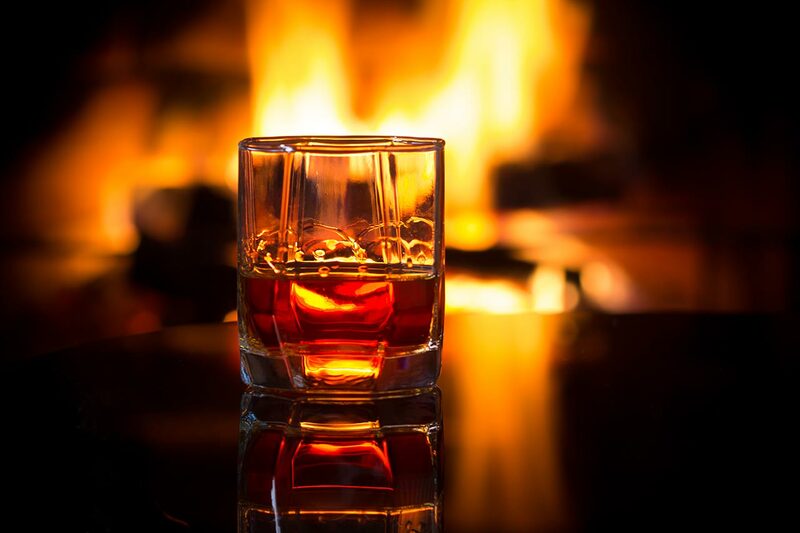 There are so many famous Scottish specialities to try like smoked salmon, haggis, black pudding and of course you can’t forget the world-famous Scotch whisky! So, when you are planning your ideal fishing holiday, first decide which species of fish you want to target. Then choose a time to visit that coincides with the best fishing time for that species. You can then arrange for your accommodation to be close to the fishing venue. If you are planning on staying for a few days, you can always target different species as this can add so much more variety. Many anglers that come for a week’s salmon fishing will also enjoy a couple of days trout or pike fishing. 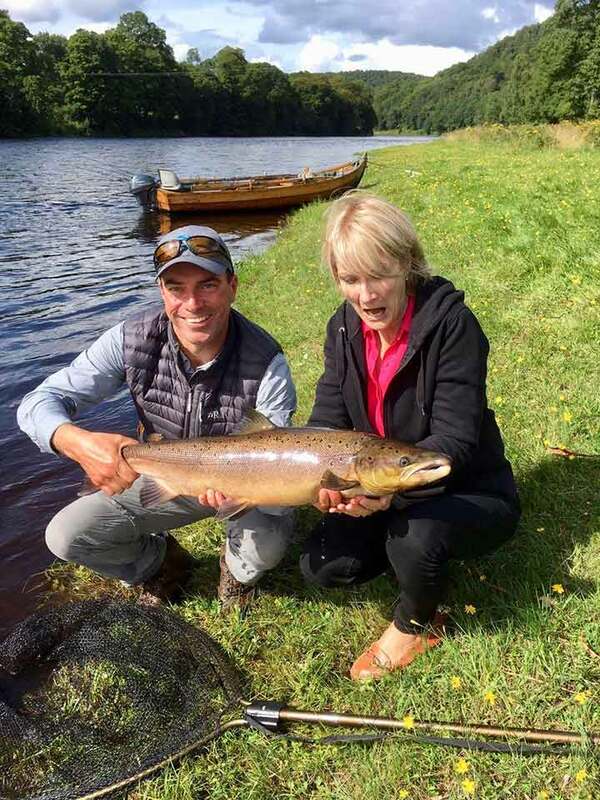 If, however, you do not want the hassle of having to book your fishing, or arrange your transport and find suitable accommodation, why not let one of the Scotland’s fishing tour operators do all the hard work? All you then have to do then is to sit back, relax and enjoy your made-to-order Scottish fishing experience. What to expect, when salmon fishing in Scotland? Most anglers that book a salmon fishing holiday like to have some idea of what to expect during their fishing break. This then gives them time to prepare, and also helps them get a valuable insight into what lies ahead of them. Preparation is key when it comes to salmon fishing in any country, and by leaving no stone unturned, you stand the best chance of having a successful fishing trip. So, what should you expect when you come salmon fishing in Scotland? Firstly, you will be greeted with a warm welcome when you arrive in Scotland. The people are very friendly and will always do all that is possible to help. As always, it is important when you come to any country to carefully consider the weather. Scotland has a very similar climate to any other Northern European country. As the salmon fishing season commences in mid-January, and runs through until the end of November, it is likely that you can encounter a variety of weather conditions depending on the time of year you visit. During the early spring months, from January through until March, the weather can be quite cold. There can be frequent snow showers, although in recent years this has been quite a rare phenomenon. The hours of daylight are also limited, especially in January and February. During these months it usually gets dark around 16:30. If you intend to come and fish in the early spring, it is imperative that you bring plenty of very warm, waterproof clothing, so that you can fish in comfort. The old adage rings true... “There is no such thing as bad weather, it’s more bad clothing”. This is especially true when it comes to salmon fishing! From April onwards, the days begin to get longer, and the weather usually improves. During the summer months, it can often be quite warm and sunny during the day and does not get dark before 22:00. If this is the case, then fishing early in the morning and then again at dusk can produce the best results. As we move into the autumn months, from September through to November, the days begin to shorten once again. It also becomes much cooler. It is not uncommon in Scotland to have snow in October and November. The weather at this time of year can be akin to early spring. When it comes to the salmon fishing venues, the facilities available for anglers is first-rate in Scotland. Much, of course, depends on the river itself. The wading can also be variable depending on the river and the beat. Some beats may not require any wading, whereas others may be better suited to the more confident wader. Almost all the beats in Scotland are private and this ensures that there are only a limited number of anglers fishing at any one time. The banks are usually well maintained and there is often good vehicular access to most of the pools. Also, most beats have the services of a ghillie and there is also a well-equipped fishing lodge for anglers to use. A ghillie is at hand to give anglers advice on tactics and techniques throughout the course of the day. The advice given by a ghillie is invaluable, especially if they are new to the beat. This can often be the difference between success and the lack of. The ghillie usually splits his time between everyone fishing on the beat. 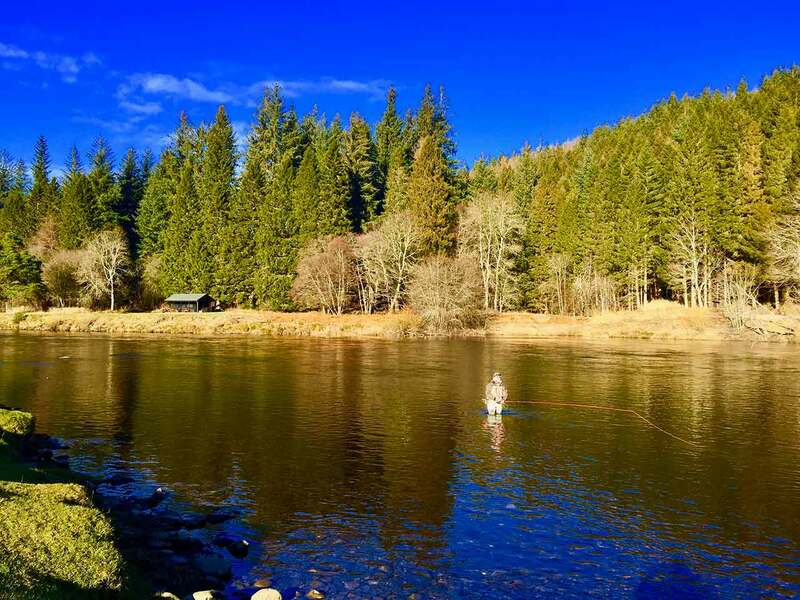 If you are fishing on rivers located in the Scottish Highlands, they are usually relatively small in size and set in some of the most beautiful locations in the country. The Scottish Highlands is a tranquil and remote wilderness, which provides a spectacular back drop for any salmon angler. Most of the rivers in this area can be comfortably covered with fourteen feet double handed fly rod. Many of the rivers in the Highlands are spate rivers, which therefore fish better if there has been a recent lift in water. If the water is low, especially during the summer months often a single handed or switch rod is often all that is required. If you are fishing on some of the larger rivers like the Spey, Dee, Tay or Tweed, a fifteen feet rod is generally more than adequate. Many of the beats on these prolific rivers have fantastic facilities for the angler. Some of the larger rivers across the country also permit spinning, as an alternative to fly fishing. The rules when it comes to spinning vary from beat to beat. In terms of what to expect when it comes to the salmon fishing itself much depends on the time of year you visit. Usually during the early spring months, the fish are large and extremely powerful. For many anglers, the spring salmon is the ultimate angling prize. At this time of year, it is unlikely that you will catch large numbers of salmon each day, however the fish you will catch will give a fight that you will never forget. During the spring months, an intermediate or sinking line (depending on the water height and temperature) coupled with a tube fly is usually perfect for the job. From late May through until the end of August is usually when the summer runs of salmon arrive. At this time of year, the fish that enter our rivers are often plentiful and consist of a mixture of grilse and larger summer salmon. With the water being usually warmer, floating or sink tip lines can be used effectively when coupled with smaller tubes or dressed flies. September and October heralds the arrival of large numbers of late autumn fish. This is when big catches can be made. At this time of year, the fish caught can often weigh in excess of thirty pounds. Often, the tactics used are similar to those used during the spring months. It is fair to say, that when you come salmon fishing to Scotland, you can expect to fish on beautiful salmon rivers, located in breath taking locations. Fishing on private beats will ensure that you will have plenty of undisturbed pools to fish through during the course of your day. Having the use of an excellent fishing lodge and getting advice from a friendly, knowledgeable ghillie will just add to the experience. One thing is for certain when you come salmon fishing in Scotland, the Scottish people will make you feel right at home! Salmon do not feed once they enter freshwater, which is what makes catching an Atlantic Salmon such a challenge. The reason why they take a fly or lure is not clear. Many people believe that is because they are either being territorial and aggressive, playful or even inquisitive. Often, there can be large numbers of fish in a pool, seeing your fly, pass them on every cast, yet they will just ignore it. On other occasions, a salmon will take the fly on the first cast. There is no rhyme nor reason when it comes to salmon fishing. It is the only sport in the world where you can do everything perfectly, yet still not get the result you were hoping for. This is often what can make salmon fishing such a challenge. No one ever said that salmon fishing was easy, which is why it is such an achievement to catch one of these magnificent creatures. If you ask any salmon angler, no matter how many fish they have caught in the past, they will always say that they remember catching their first ever salmon. Catching your first salmon is such a magical experience and one that will live with you forever. Often, it can take months or even years before you catch your first salmon and the wait is well worth it. Salmon fishing truly is a sport that follows no rules and you just never know when that line will tighten. Often, it happens when you least expect it. Many anglers, who are in pursuit of their first salmon, say that the more blank days they have, only makes them more determined to catch a fish with the challenge becoming somewhat of an obsession. It must be remembered, that just because you entice a salmon into taking your fly or lure, does not necessarily mean that you will go on to land the fish. There are so many variables even after the fish is hooked. Firstly, you need to consider how the fish takes the fly. Often, if the fish takes the fly in a half-hearted, timid fashion, a firm hook hold may not be established. This can lead to the angler losing the fish during the course of the fight. If you have never caught a salmon before, this can be both frustrating and heart breaking in equal measure. Even prior to hooking a fish, it is important that the drag on your reel is properly adjusted. A reel with adequate drag will ensure that the fish tires during the fight. If the drag is set too lightly, then often the fish can have free rein and run long distances, and this can end in disaster. Conversely, if the drag is set too tightly, you may go on to pull the hook form the mouth of the fish or even snap the leader. It is therefore best to set the drag on your reel, before you even wet a line. If the drag is correctly set, you should not need to adjust it during the course of a long fight. Many anglers can also get quite impatient once they have hooked their first salmon which can be a recipe for disaster. It is important to take your time while playing the fish. It is also always worth remembering, if and when the fish hits shallow water during the fight, it will often make a further run back into a deeper part of the pool. Anglers should be prepared for this. The fish should not be netted until it is lying on its side, on the surface of the water. This is an indication that the fish is beginning to tire. Many a first salmon has been lost when an angler has tried to net a fish before it is ready. Catching your first Atlantic Salmon is a very special experience. It gives you a great sense of achievement. You may have waited for months, or even years, before you hook a salmon. Once you do hook that first fish though, the last thing you want is to lose it during the fight. You have no control on how the salmon will take your fly or lure initially as this is in the lap of the gods. If the fish is well hooked, and you have a correctly set drag, make sure you take your time during the fight, as this will give the best chance of landing that treasured first salmon. There is no exact science when it comes to hooking an Atlantic Salmon. Much depends on the mood of the fish and how it goes on to take the fly or lure. Ideally, you want the fish to take in an aggressive confident manner, as this is when more often than not, a good hook hold is achieved. Unfortunately, as anglers, we have no control over this. Generally, a fish will move out from its lie before advancing up to take the fly. After, the fish takes the fly, it will usually turn back in an attempt to return to its lie. It is then, when the fish turns with the fly in its mouth, that the angler feels the line tighten, and it is at this point that, hopefully, the fish will be hooked in the scissors (at the side of its mouth). Usually when a fish is hooked in the scissors, a firm hook hold is achieved. Another big advantage of hooking a salmon in the scissors is that there is usually very little damage done to the mouth of the fish, during the take, or when the fly is being removed. After the fish is landed and the hook is removed, it can be returned to the water to swim away, unharmed. There are a few techniques that you can employ immediately after the fish takes, which may increase your chances of landing it. Each angler has their own favoured technique and much, of course, depends on the method you are using, whether that be fly fishing or spinning. When it comes to fly fishing for salmon, a lot depends on how you are fishing when the fish takes. If there is plenty of current in the pool that you are fishing, it may be the case that you are allowing the fly to swing around naturally after casting. In such a scenario, the fly will swing around in the current after casting, until it comes parallel to your own bank, or directly downstream of you, if wading. Usually, once the fly is downstream of where you are standing, you go on to strip some line in by hand before casting again. The fish can take the fly anytime whilst it is swinging. There are generally two techniques used by anglers, when a fish takes when fishing in such a manner, to ensure a firm hook hold. Opinion is greatly divided on which technique is better. Firstly, you can just hold the rod without touching the line, so when the fish takes, it directly pulls line from the fly reel. This is the more direct approach. Once the fish has pulled line from the reel, the idea is to gradually lift the rod up and tighten into the fish. The satisfying advantage of this direct method, is that you can hear that terrific noise from the fly reel. Many experienced anglers can tell from the initial noise of the reel, how aggressive the take actually is. The second method you can use to hook a fish, when the fly is swinging around in the current, is by holding a small loop of line in your hand. The loop of line dangles between your hand and the reel. When a fish takes, you release the loop of line. The theory behind this technique is that by releasing the free line in your hand when the fish takes, it still has time to turn, with the fly in its mouth, before heading back to the lie. This should ensure that the fish is well hooked in the scissors. Most anglers use either one method or the other, and it would be fair to say that they both work. It is also very important to remember not to strike (lift the rod very quickly) when a fish takes. Many trout anglers that are new to salmon fishing do this, due to using the method that they are familiar with. Salmon fishing is very different from trout fishing, especially when the fish takes. Being too quick in lifting the rod can often result in pulling the fly from the mouth of the fish, which is the last thing you want to do. Sometimes salmon can take a fly when it is on the dangle. This refers to when the fly is directly downstream of you, after it has stopped swinging around in the current. Landing fish that have been hooked on the dangle is notoriously difficult. This is usually because the fly is more of a stationary target for the fish. More fish are lost then landed, when hooked on the dangle. Both methods of hooking a fish on the fly as described above, seem to have similar results. So far, we have looked at hooking a salmon when the fly is left to swing around naturally in the current but what about when there is limited current and you decide to impart movement on the fly by handling? In these situations often anglers put extra movement on the fly, by stripping the fly line at various speeds after casting. In such circumstances, when a fish takes, it should be hooked by the simple stripping motion of the fly line. Once the fish takes, it is again, about slowly raising the rod and maintaining adequate tension on the fly line. When it comes to hooking a salmon when spinning, much depends on the lure itself. If you are using a spoon or a Devon Minnow, often these can be allowed to swing around in the current like a fly. Once a fish takes, it is about lifting the rod slowly and tightening into the fish. When spinning, often many fish are hooked when performing a slow steady retrieve. If this is the case, usually the fish will be well hooked due to the motion of the lure being retrieved. When we are discussing how to achieve an effective hook hold, it is also important to consider the type of hook that you are using, especially when it comes to fly fishing. There is much debate on which type of hook gives you the most secure hold when using tube flies. Some anglers prefer using treble hooks, yet in recent times, more anglers are reverting to double or even single hooks. It is definitely easier to release the fish unharmed if it is hooked on a single or double hook. Which type of hook provides the best hook hold? Well a lot is down to the individual angler and what her or she has confidence in. If the fish takes the fly aggressively and confidently it does not really matter which type of hook you are using as it is likely to be well hooked. Hooking a salmon greatly hinges on luck. The old saying goes, “If a fish is hooked, it’s hooked”. This is so true. As anglers, we have no control on how aggressive that initial take is going to be, as that depends on the fish itself. The best thing to do is to use a technique that works well for you and which you have confidence in. When it comes to fishing in Scotland, every salmon pool is different, each having a unique character. The differences can be vast, ranging from width, length, depth and current, of the individual pool in question. These are just a few examples of how salmon pools vary and there are often many other important characteristics to consider. Many pools are more productive at certain times of the year and in some cases, in specific heights of water. This is why some pools can be classified as being either high or low water pools. This refers to the height of water at which the pool fishes best. As salmon pools vary so much, it can be difficult to generalise on how to fly fish down an individual pool. Much depends on how much current there is in the pool itself, and this, of course, is directly related to the river level. However, there are a few, very general principles that can be followed when fly fishing down a salmon pool, which apply to almost every situation. Before considering how to fish down a salmon pool, you need to think about the pool itself. It can be useful to divide the pool into three sections, the head, main body and the tail of the pool. The head of the pool is where the pool starts. Often, the head of a pool can be quite narrow with a fast-flowing course of water entering it. The head can also be quite shallow compared to the rest of the pool itself. The body of the pool is often the deepest and widest part. This is usually where the current is slower and often where the bulk of the resident fish lie, especially during the spring and summer months. The tail is the final section, just before water flows out of the pool. Every pool is different, but often the tail can be shallower, narrower and have more current than the main body of the pool. Prior to even wetting a line you need to make a very important tactical decision, whether you need to wade, and if so, to what depth. When considering this conundrum, safety is paramount. You should only wade if you are wearing a buoyancy aid, carrying a wading stick and feel that you have the confidence and experience to do so. If you are happy to wade, the next question you need to ask yourself is whether it is necessary. This can depend on a multitude of parameters, which include the width of the pool, where in the pool the fish are lying and, of course, your own casting ability. If you are fishing one of the larger rivers in Scotland and the fish are lying towards the far bank, it may be necessary to wade further out so that you can cover the fish. Other reasons for wading could be if there are obstacles behind, making it difficult to cast, like trees or even a steep high bank. Generally, the rule is to avoid wading where possible as this can often disturb the water and spook any fish in the pool. Anglers should only wade if it is safe to do so, and if a discernible advantage can be gained from entering the water. It may be the case that only certain parts of the pool require wading. It is also important to remember not to wade too far. This not only reduces your casting distance, making wading counterproductive, but can often also spook the fish. Once the decision around wading has been made, normally you would start fishing at the head of the salmon pool. If this part of the pool is narrow, you would initially fish with a short line, and then gradually lengthen it. The idea, if there is adequate flow in the pool, is to cast slightly downstream and then let the fly line swing around in the current in an arc. Once the line has swung parallel to the near bank, directly downstream from where you are standing, you would strip off some more line from the reel and then cast again at a similar angle. After each cast you should take two steps downstream until you reach the tail of the pool. By using this method, you are ensuring that you have covered every inch of the pool methodically. It is possible for a salmon to take at any time, from when the fly hits the water after casting, to when it stops swinging and is directly downstream of you. If there is very little current in the pool, or in certain parts of the pool, you may need to adjust your casting angle or maybe even mend the fly line. Often in such circumstances, anglers choose to strip the fly line for extra movement after casting, as there may not be enough current for the fly to move naturally. When using this method, you would follow the same process to cover the water, starting at the head of the pool and taking two steps downstream after every cast. After fishing through the entire pool, you may decide to change your fly or fly line and fish down the pool once again or even try pastures new. The technique described above, of course, is only valid if the entire pool is worth fishing and should be used as a general guide when fishing down through a salmon pool. It maybe that, at a specific time of year or water height, one or more parts of the pool may not be worth fishing. For example, during the summer months when the water is low it can often only be worth fishing the fast, oxygenated water at the head of the pool, especially if the fish are running. Conversely, when the water is high and cold during the spring months, the most productive part of the pool may be the slower main body, as this is where it is easier for the fish to rest. In such circumstances you may not even fish the head and tail of the pool at all. It is also important to remember when salmon fishing in Scotland to never start fishing in front of a fellow angler, who has already begun fishing the pool. This is poor salmon fishing etiquette and deemed as being unsportsmanlike. Instead, you should always start fishing upstream from any angler already fishing the pool, ensuring that you have given him or her plenty of space. Every river in Scotland is different as is every salmon pool, and this is what makes fishing on different rivers so appealing. With each river in Scotland, comes its own unique set of challenges, which makes the fishing both appealing, and exciting, in equal measure. Regardless of the salmon pool on which you are fishing, the basic principles are the same when it comes to fly fishing. After fishing down a pool, you want to confidently be able to say that you covered the water to the best of your ability, in a precise and methodical fashion. If this is the case, then you stand an excellent chance of making contact with some hard fighting Scottish salmon! It can be hard enough to hook a salmon, but of course this does not guarantee that ultimate prize of actually landing the fish. Salmon can be very unpredictable when hooked and their fighting qualities, speed and power are second to none. A fish can easily run downstream over a hundred yards at break neck speed, stripping fly line from your reel at will. In addition to the speed and power of these magnificent creatures, they can also be quite unpredictable. 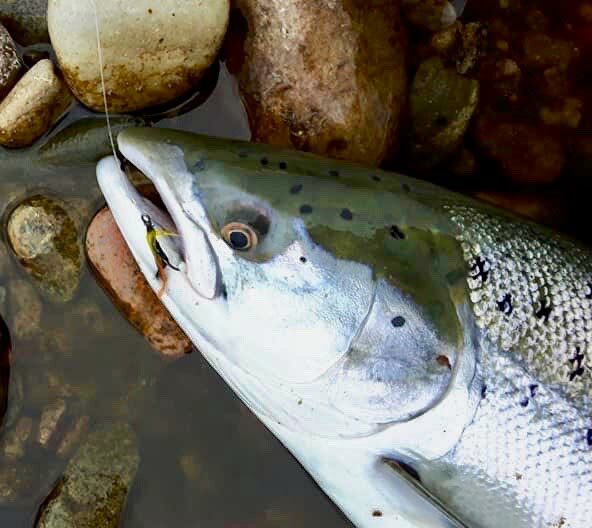 When hooked, salmon can often try and snag your line behind obstructions like boulders or sunken trees in the river, in a bid to escape, and this can lead to a disastrous outcome. For many anglers, the battle that commences after a salmon takes the fly, is the most exciting part of the entire experience. Fish can be regularly lost during a long and arduous fight. Often, this is not the anglers fault as the fish may have been lightly hooked. There is nothing more heart breaking than losing a good fish, especially if you have been playing it for some time. So, what can you do to improve your chances of landing the elusive salmon? It is worth remembering that you will never land 100% of the salmon that you hook. It is just the nature of the sport, and it is this uncertainty that makes the whole experience all the more exciting. If the fish takes a fly in a half-hearted, timid manner, then often a secure hook hold is not established and there is a chance that the fish will be lost during the course of the fight. In such circumstances, it does not matter what you do as angler whilst playing the fish, as the outcome will be the same. There are, however, a few things you can do prior to, and during the fight, which can improve your chances of landing that big bar of silver, once it is hooked. Firstly, before even wetting a line, it is important that you study the pool. You need to look for any potential snags in the water and these include big boulders, partially submerged branches, tree stumps and any other debris that may come into play during the fight. By being aware of where these are situated in the pool, you then have more chance of keeping the fish away from these potential pitfalls during the fight. If you are intending to wade whilst fishing through the pool, it is important to have an idea where the easiest place would be to get out of the water quickly. If a fish makes a long run, you may need to follow it, and this is much more easily done on dry land. In addition to looking at possible exit points for getting out of the water, you would also want to consider where the best place would be to land the fish. Often, a nice flat grassy bank or a soft sandy bay can be perfect for this. If you have decided where you are going to land the fish before even hooking it, then you have a clear plan in your head, once the fish takes. Prior to starting fishing, you also want to decide whether you want to use a net when landing. Much will depend on how experienced you are, as well as the characteristics of the pool itself. Would it be easy to either tail or beech the fish? It is important to make that decision before starting to fish, so again you have a clear plan of what you are trying to do, once the fish is hooked. Finally, you want to make sure that the drag on your reel is correctly set. Having a correctly adjusted drag is so important, as this can help maintain adequate tension on the fly line and also tire the fish, especially if it makes long runs. The drag on your reel is there to ensure that you have more control over the fish during the fight. Once the drag has been set, normally there should be no need to adjust it again, unless the fish tries to do something unpredictable, like exit the pool, or head directly for a snag. So far, we have looked at what to do prior to even casting a line, but what about when the fish actually takes? There is no greater feeling than when that line tightens, and there is a salmon at the other end. Probably the most important thing to remember is to try and stay cool and calm. Often, that is easier said than done. As soon as the fish takes, you should gently lift the rod and maintain adequate tension on the fly line. After you have established initially contact, it is important to get the fish on to the reel as soon as possible. The last thing you want to do is have lots of free running fly line lying at your feet, since if the fish runs, this could get tangled and spell disaster. Once the fish is being played on the reel, it is then important to get out of the water as soon as possible if you are wading. This is because, if the fish takes a long run, you may need to follow it down the pool. It is much easier and quicker to do this on dry land. Whilst playing the fish, it is important to let the fish run it wants to do so. This is where a properly adjusted drag comes into play. Hopefully, the fish will run in a controlled manner and begin to tire slowly, as it is moving against the tension of the drag. A fish will often run a number of times before it begins to tire, and it is important for the angler to bear this in mind. If the fish is stripping line very quickly from the reel, and you are unable to keep adequate tension on the line, it is important to follow the fish in whichever direction it is heading until contact has been re-established. If possible, it is always better to try and keep the fish in the pool in which it was first hooked. Throughout the fight, the rod should be kept well up in the air and there should be a decent bend going through it. This ensures that you stay in touch with the fish at all times and that the line remains taut. Too often, you see the tip of the rod drop during the course of the fight, with the line subsequently going slack. This can often lead to a bad outcome. During the fight also try and keep the fish away from any potential snags that you identified prior to fishing. This can be done by applying side strain on the fish, or in extreme circumstances tightening the drag on your reel ever so slightly. It is also worth bearing in mind that, if and when the fish comes close to shallow water, it may make a further run and it is best to be prepared for this. Once the fish starts to lie on its side, on the surface of the water, you know that it is beginning to tire. This is the sign you need to look for before even contemplating landing the fish. If the fish is on its side for a long period of time, then it is almost beat. When it comes to landing the fish, there are usually three options. If you are experienced and on your own, then tailing a fish in the water may be the best method. You can do this by taking a firm grip of the wrist of the tail, once the fish has tired. The fly can then be removed, with the fish still in the water and then returned. Tailing a fish can be quite difficult, especially if you have little experience. Instead, you may opt to beech the fish. This is done by coaxing the fish on to the bank once it has become tired. This should only be done if the surface you are beaching the fish on is soft, as this will avoid damaging it. Sand or wet grass on the banks of the river is ideal. Some anglers prefer to use a landing net. This is a good option if you have a fellow angler in close vicinity to assist you. The great thing about using a net is that the fish, once unhooked, can recover safely in the net before being returned. When netting a fish, it is important to hold the net in the water and be patient. Let the fish come to you, and don’t make a stab at it. This can often lead to the fish making further runs. There is no greater feeling of relief, after a long hard fight, when the fish is safely in the landing net. As salmon anglers, we all hate losing fish, simply because many of us spend hours, days or even weeks trying to get that initial take. The fun starts when the fish is hooked, and the unpredictability of the fight is what makes it so exciting. Often, there is nothing you can do if you lose a fish, as it is out with your control. However, by following a few simple principles, prior to and during the fight, you stand a much better chance of landing that hard fighting Scottish salmon! Most salmon anglers take the welfare of their quarry very seriously. These magnificent fish, once landed, should be treated with the utmost of respect and dignity that they deserve. The vast majority of anglers nowadays practice catch and release. It is therefore important, once the fish has been landed, to limit any distress, keep the fish in the water for as long as possible, and revive it fully before releasing it. Many anglers like to take a picture of their catch before releasing the fish, and this should be done with a minimum of fuss. If salmon are not unhooked in the correct manner and man-handled once landed, the consequences for the fish can be fatal. When unhooking a salmon, you need to be very careful. Firstly, a lot depends on how the fish is landed, whether that be with the use of a net or the fish being tailed or beached. The fish should only be beached if there is a soft surface like wet sand or grass at the side of the pool. Each method of landing the fish has its pros and cons. Netting a salmon is a good way to land a fish. This is the perfect method if you are fishing in the company of others, as it can be tricky to land a fish in a net if alone. It is important to use a knotless net, as this will not remove the protective slime on the scales of the fish. The great advantage of using a net is that, once the fish is landed, it can be kept in the water while the hook is removed. This gives the fish a chance to recover after a long draining fight. Using a net is also good when it comes to taking pictures. The fish can be kept in the water, while the picture is being taken. Once the fish has recovered, it can then be released. During this whole process, the fish need not leave the water. However, if you are inexperienced and alone on the bank, it can be difficult to net a fish. You may find yourself considering alternative methods, when it comes to landing a fish. Some anglers prefer tailing the fish and this can be a good option. This involves guiding the fish into shallow water when it is on its side, before bending down and gripping it firmly by the wrist of the tail. The fish should then be kept in the water while the hook is being removed. The third alternative is probably the easiest way to land a fish if you are on your own. This is by beaching the fish. This is done by guiding the fish onto a soft surface on the bank, whether that be wet grass or sand. Beaching a fish should only be considered if there is a soft surface available at the water’s edge, as this will not damage the fish. Once the fish is beached, the hook can be removed, and the fish revived. Once the fish has been landed it also important to consider how to unhook the fish whilst causing minimum damage and distress Firstly, you need to think about the type of hooks that you are using. It is better to use barbless hooks, as it is much easier to unhook the fish. Also, it is always better to use single or double hooks, as opposed to trebles, as again it makes it easier to unhook the fish after landing. Indeed, many fishing beats around Scotland only permit the use of barbless hooks, with treble hooks being banned. When it comes to unhooking the fish, a lot depends on where in the mouth it is hooked. Of course, we as anglers have no control over this. Ideally, the fish will be hooked in the scissors (in the side of the mouth). If this is the case, then it is quite easy to remove the hook. It is always better to use pliers. By using pliers, if the fish were to move when you are trying to unhook it, there is less chance that the hook will get caught in your hand. The hook should be removed carefully, and gently, where possible. The worst-case scenario is when the fish is hooked towards the back of the mouth, or even in the gills. This can make removing the hook very difficult. The pliers can be very helpful, if the fish is hooked towards the back of the mouth, as they can be used to tease the hook out. If the fish is hooked in the gills, you have to be very cautious. The gills of any fish are very sensitive and delicate. Once a fish starts to bleed from the gills, they often die. It is worth considering, if the fish is deeply hooked in the gills but not bleeding, to cut your nylon close to the mouth of the fish and leave the fly. The fish will usually shed the hook with time. This is a much better option than trying to remove a hook from the gills of a fish. After the fish is unhooked, many anglers like to take a quick picture. Often this can be done with the fish in the net after it has been revived. If a net has not been used, then it is important to keep the time that the fish is out of the water to a minimum. The fish should be lifted with two hands and the body weight of the fish should be supported at all times. Once the picture has been taken the fish be revived again if necessary, and subsequently released. It is very important to revive the fish prior to releasing it. This involves holding the fish in the water with both hands. The fish can be gently moved back and forth in the water to get the oxygen flowing through its gills. It is quite easy to tell when the fish is ready to be released, as it will start to kick in your hands as it recovers. Usually, after three strong kicks, the fish is ready to go. Once you have landed a salmon, it is always important to handle the fish with care and due diligence prior to releasing it. By following a few simple rules, including using barbless, single and double hooks, carefully reviving it and not removing it from the water, the fish stands the best chance of swimming away unharmed, ready to continue its important journey upstream. The vast majority of private salmon fishing beats in Scotland employ the services of a ghillie. In Scotland, salmon fishing ghillies are invaluable and worth their weight in gold. Having a good experienced ghille can often be the difference between success and failure. A ghillie is usually employed by the owners of the beat or estate that you are fishing on. Ghillies are there to assist any anglers that are fishing on the beat. The services of the ghillie are usually shared among everyone that is fishing on a given day. The ghillie will usually divide his time between anglers. Some beats and estates are large enough to necessitate two, or even three ghillies. The ghillie will often give the angler advice on the most productive pools to fish and where the best lies are. He will also give guidance on what lines and flies to use and be at hand to give any tips on casting, if required. Away from these duties, ghillies also have to undertake beat maintenance. This may involve making sure that the river banks and paths are clear, maintaining the fishing huts and boats, and doing any other work that may be required on the beat. Much of the essential maintenance on a beat is done by the ghillies during the close season. It is important not to confuse a ghillie with a fishing guide. A fishing guide provides a one to one service for their clients. So, a guide would usually be at your side through the course of the entire day, giving useful hints and tips on tactics and technique. The guide would also be at hand to net the fish that you go on to hook. Apart from having a vast wealth of knowledge and experience when it comes to salmon fishing, many ghillies have wonderful stories that can be very entertaining. There is nothing better than establishing a good chemistry with your ghillie, as this will only add to the experience of your day’s fishing. It is traditional to tip your ghillie after your day’s fishing. This is a custom that has gone back generations. Tipping a ghillie is a way of showing your appreciation and gratitude for the helpful assistance he has given you through the course of the day. The amount you tip your ghillie is, of course, a very personal matter. However, this should never be dependent on the number of fish you catch. Every angler is different when it comes to what they can afford. However, as a general rule, a minimum is anything between ten to twenty pounds per day. This is the usual standard ball park figure. 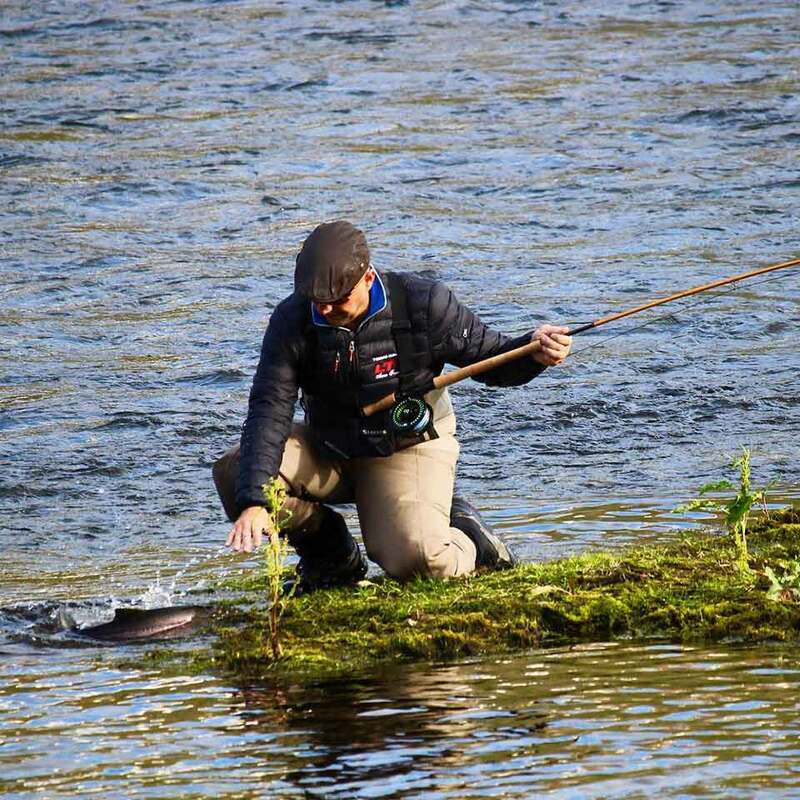 Having an experienced ghillie is invaluable when it comes to salmon fishing in Scotland. Ghillies have an intimate knowledge of the water which can be vital. They work very hard through the course of the season and see the river every day in a different light. As an angler, it is not only traditional, but also very important to tip your ghillie correctly after a day’s salmon fishing on the river. Atlantic Salmon fishing is never easy. It is the sheer nature of the sport which makes it so challenging, and this is why salmon are held in such high esteem, amongst game fishermen. For many anglers, catching a salmon on the fly is the ultimate achievement and it is easy to see why. Unlike most other types of fish, salmon do not feed in freshwater. This in itself makes the sport hard enough. In addition to this, salmon are known for being extremely fickle and this can be infuriating. It is not uncommon to have a number of fish in a pool, ignoring your fly for no apparent reason and often, no matter what you do, they will just not take. Scotland is a salmon fishing paradise. There are so many plentiful rivers to choose from, that the salmon fishing opportunities are truly endless. Just like anywhere in the world, salmon fishing in Scotland can be challenging. When it comes to salmon fishing, so much depends on the weather and water conditions. These parameters can play an integral part on how productive the fishing can be. In Scotland, especially during the early spring months the weather can be quite inhospitable. There are often frequent snow showers, and this coupled with strong winds can make salmon fishing difficult. Also, at this time of year, river levels can be high, which is often not ideal when you are searching for that elusive spring salmon. However, with some perseverance, the rewards are well worth the effort. Some of the spring salmon caught in Scotland are extremely powerful and very large in size. 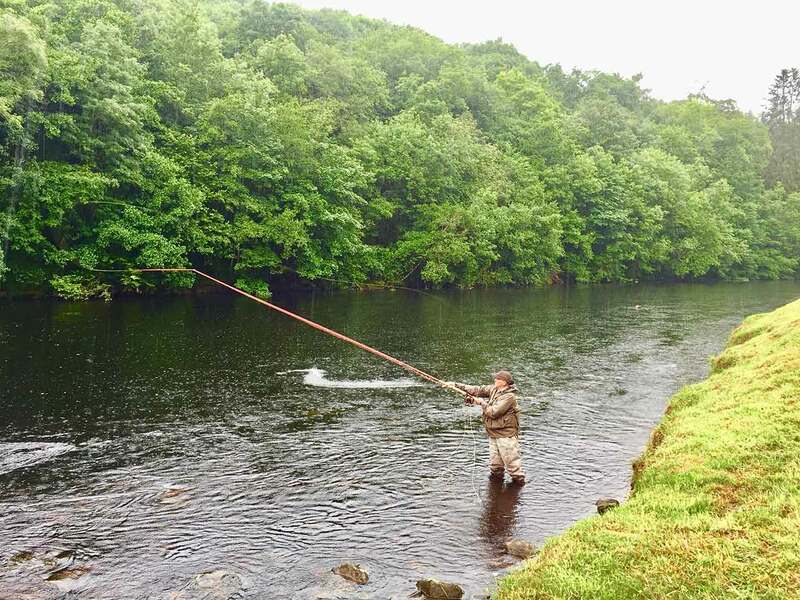 There are times when salmon fishing in Scotland during the summer months can also be challenging and this again is almost always weather, or water related. During the summer months, river levels can be low and water temperatures high fairly regularly. This does not make for the best fishing conditions. Salmon can be notoriously difficult to catch in low, warm water. This can be overcome by being selective in the times that you fish. In such conditions, it is often better to fish first thing in the morning and then again at dusk. These are usually the coolest times of the day and can often be the most productive. Usually, salmon are caught more consistently during the autumn months. At this time of year, most of Scotland’s rivers have a good head of fish. During the months of September and October, often the fish become more aggressive and this can incline them more into taking a fly more readily. If, however, water levels are low and warm, and there has been no significant lift in river levels since the summer, the fishing can again prove challenging. Scotland is no different from any other country when it comes to salmon fishing. You need to have both favourable weather and water conditions to get the best from your fishing. Even if you have perfect conditions, and there are plenty of fish in the pools, there is no guarantee that you will catch a fish. It is the sheer unpredictability of salmon fishing which makes it so appealing, and if it was not such a challenge, then catching an Atlantic Salmon would not be the ultimate achievement among the game fishing fraternity. Atlantic Salmon have populated Scotland’s rivers, in large numbers, for hundreds of years. There are a multitude of rivers in Scotland and most of these have decent runs of Atlantic Salmon. Scotland’s rivers flow into the sea at various locations around the country. These include the North Sea, Atlantic Ocean, Firth of Clyde and the Solway Firth. Many of these rivers have fantastic habitats to support juvenile fish and thankfully the waters remain relatively unpolluted. This also provides a perfect habitat and breeding ground for the adult fish. Just like anywhere in the world, the salmon population in Scotland has declined in recent decades. The reasons for this are unclear but are likely to be multifactorial. The boom in the fish farming industry in the West Coast of Scotland has certainly not helped, and when you couple this with limited feeding in the oceans and the hydroelectric power schemes, it is easy to see why numbers have dropped. However, in recent years a number of conservation measures have been introduced, and this has seen an improvement in the numbers of fish returning back to Scotland’s rivers. There has been a ban on the sale of all rod caught wild salmon, plus, all fish now caught by anglers on rod and line, have to be returned unharmed before 1st April. In addition to this, the netting of wild salmon in Scotland’s estuaries has thankfully also come to an end. There have been numerous habitat improvement programmes and hatcheries built on the banks of various rivers and this has definitely helped support the numbers of wild fish returning to our Scottish rivers. Salmon run up Scotland’s rivers throughout the course of the year. Usually, the biggest runs of fish enter Scotland’s rivers between May and September. The runs of salmon peak at different times of the year depending on the river. From March onwards, the runs of spring salmon tend to increase, and they usually go on to peak during the months of April and May. Many rivers in the Scottish Highlands have healthy populations of spring fish and these include the Thurso, Helmsdale, Naver and Spey. Other rivers in Scotland that enjoy good runs of spring salmon include, amongst others, the Dee, Tay, North Esk and Tweed. 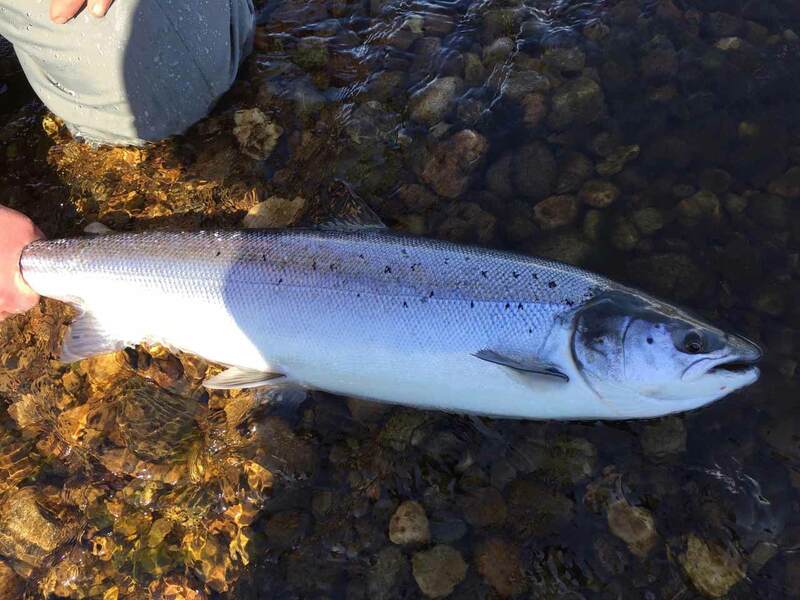 During the summer months, there are usually large numbers of grilse and summer salmon which enter Scotland’s rivers, although the summer fish are generally smaller in size compared to their spring equivalent. Most of Scotland’s rivers enjoy a good run of summer fish. It is at this time of year, that the rivers in the West Coast of Scotland become more populated with adult salmon. Generally, in this part of Scotland, the fish that run the rivers are also smaller in size, compared to other rivers across the country. September and October usually heralds the arrival of the autumn fish to Scotland’s shores. These fish are often bigger than the summer fish. The number of fish that enter Scotland’s rivers during this time vary greatly. Some rivers have a very limited number of fresh fish at this stage of the season. Traditionally, rivers like the Tay, Tweed, Teith and Annan have decent late season runs of fish. At this time of year, the rivers are at their most populated, as there is a decent head of spring and summer salmon already in the system. The salmon in Scotland’s rivers usually spawn anytime from November through to early December. Again, every river is different when it comes to the specific spawning times, and much depends on the water temperature itself. The fertilised eggs that are produced during this process usually remain dormant until mid-March, after which they start to hatch. These juvenile fish will spend a few years in the river, feeding, before they head out to sea. The majority of adult fish that spawn end up dying in the river, but a small proportion do make it back to the sea the following year. These fish then migrate once again, coming back to the river after a few years, as multi sea wintered fish. The Atlantic Salmon has populated Scotland’s rivers for hundreds of years and in the 1950’s and 1960’s, the numbers of fish returning to Scottish shores were prolific. At the turn of the century, there was a significant decline in the numbers of wild fish running Scotland’s rivers. However, in recent years, with various conservation measures being introduced, coupled with hatchery stocking programmes and habitat improvement, the numbers of wild fish returning to Scotland’s rivers have increased. This can only bode well for future stocks and the survival of the Scottish Atlantic Salmon. Prove your not a bot. What is 8 + 28?